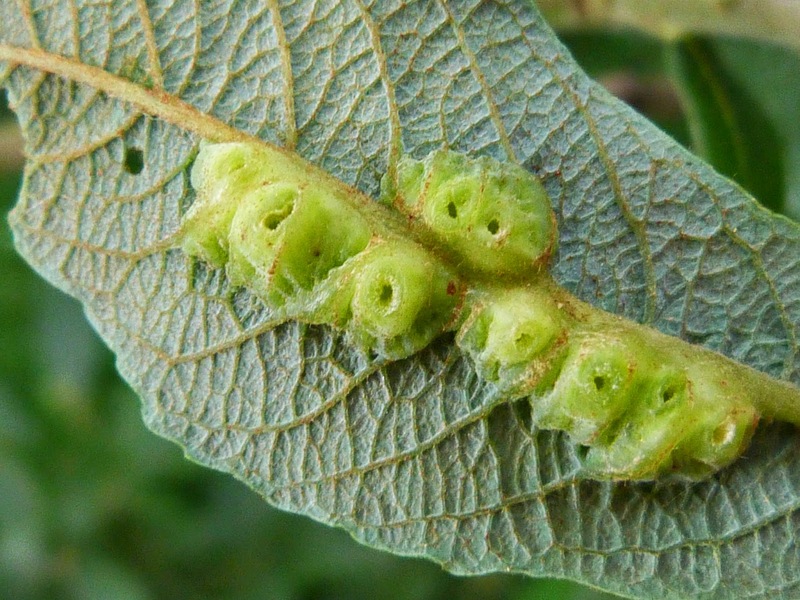 One of the purposes of producing a gall is to protect the larvae inside from predators - and you would think the gall wasp larvae would be pretty safe tucked inside the middle of these galls. 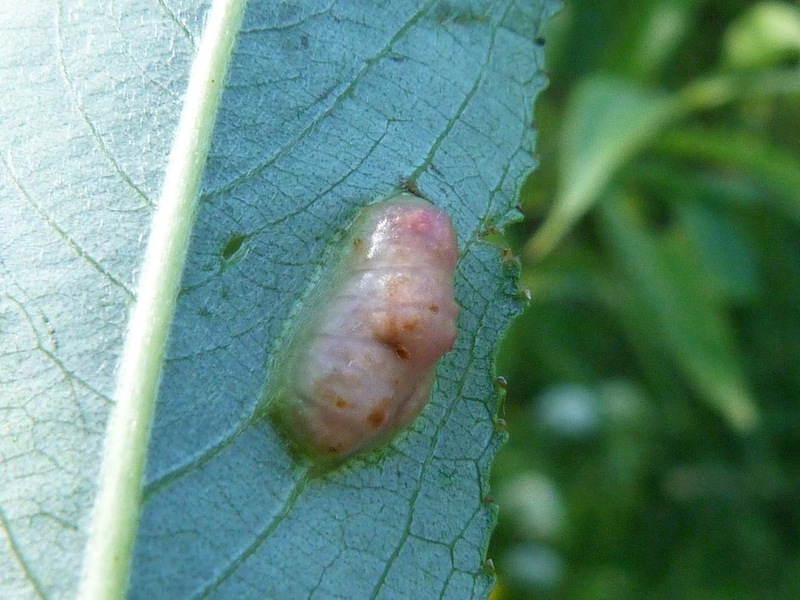 However, the metallic green female parasitoid on top of one of these galls is in the process of parasitising the gall wasp larva inside, by piercing the gall with her long ovipositor (the egg laying 'spike' at her rear) and laying her own egg into the existing larva. 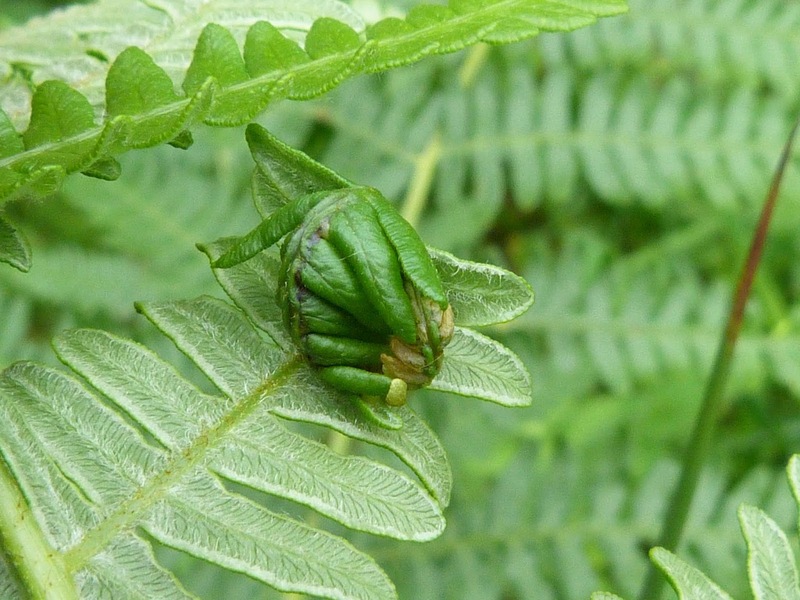 If you look carefully, you can see her ovipositor at the bottom of her abdomen being pushed inside the gall. The 'tail' your can see behind her is a sheath that protects her delicate ovipositor and is flicked out of the way when she comes to deposit her eggs. You couldn't make it up, could you? It really is a fascinating and often gruesome world out there. 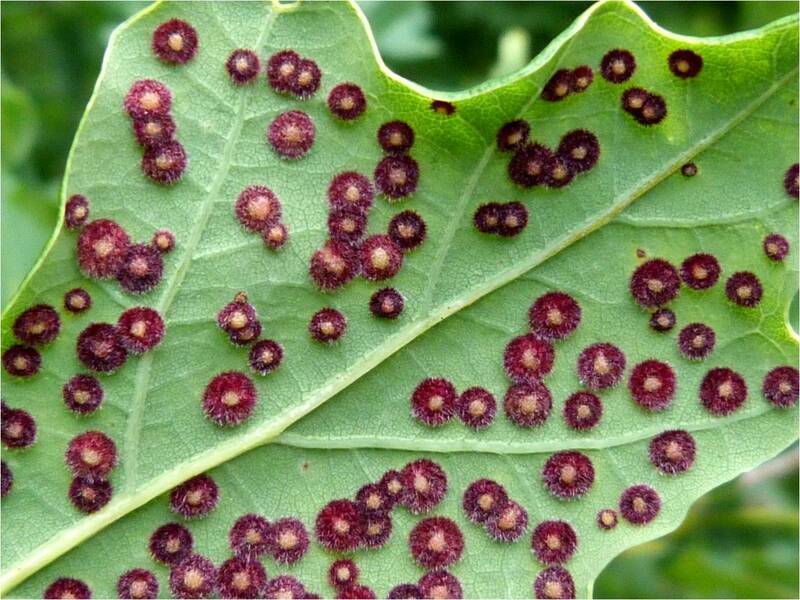 Galls are produced when plants are attacked by various gall-causing organisms (often insects) and the gall is the plants response to the attack. 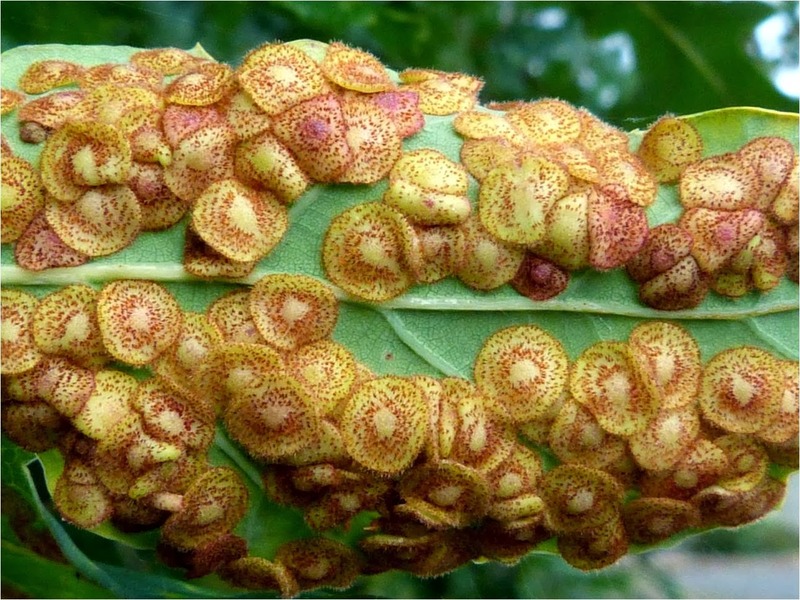 It is often relatively straight forward to identify the gall and therefore what organism caused the gall. 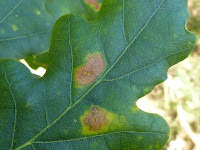 The galls in the photos above were discovered on the underside of an Oak leaf. 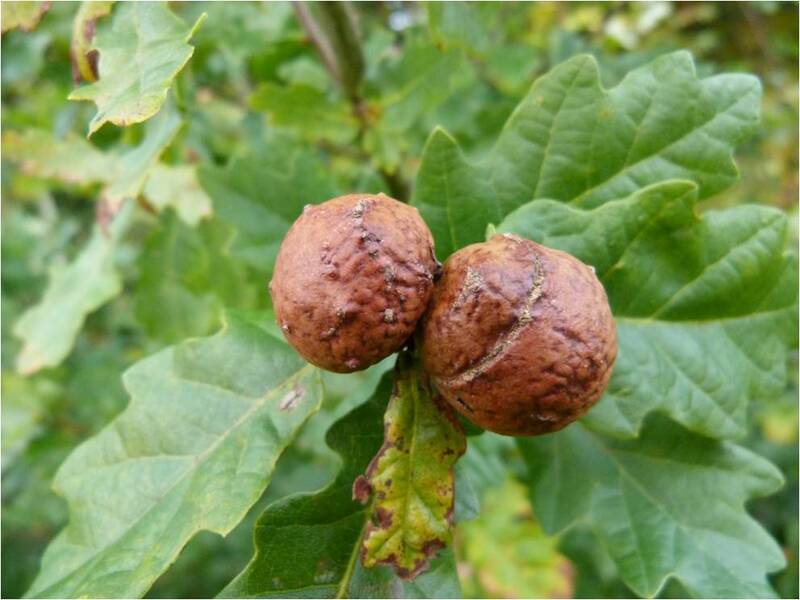 Oaks often have a large number of different galls on their flowers, acorns and leaves. 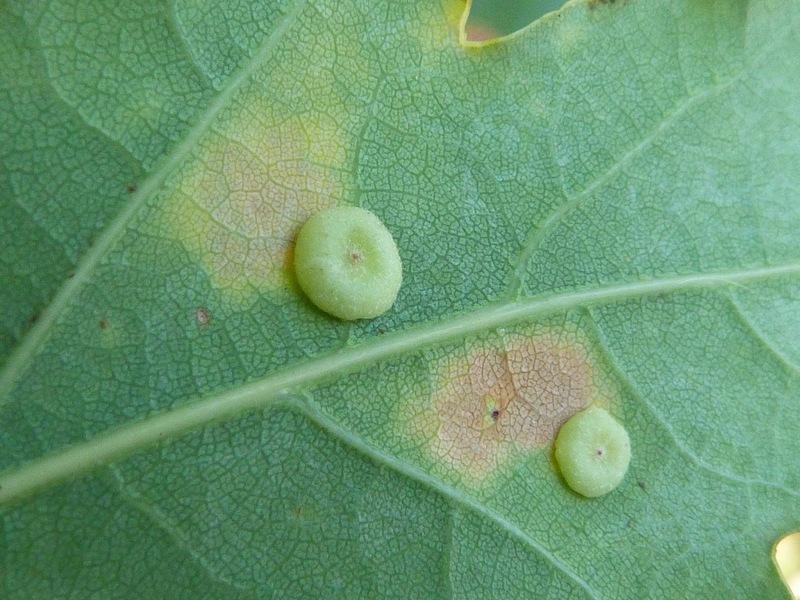 These galls are caused by a Cynipid gall wasp each gall housing a single gall wasp. 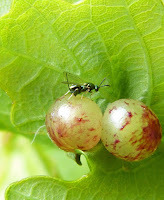 This wasp has an 'agamic' generation which doesn't need male and female interaction and a bisexual general which result in different types of galls being produced. 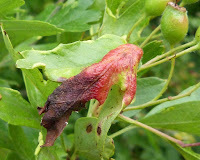 The agamic generation produces the early stage galls (middle red photo) which have a yellowish raised middle and a red hairy surround. The later stage agamic galls (middle cream-orange photos) are cream coloured with orangey-pink speckles. The photo on the bottom shows the upper side of the leaf whose under side is covered in common spangle galls - these yellow spots being a give-away sign. 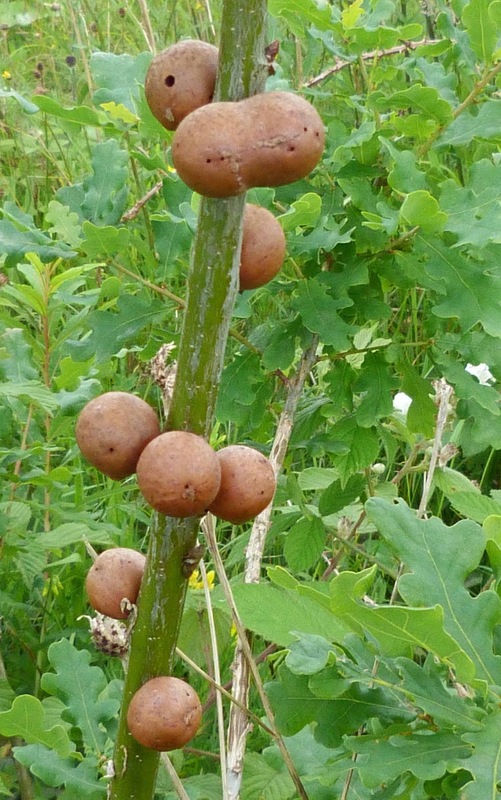 These galls have been described as 'Mexican-hat-shaped' but I would have to be less discreet and say they look more like something else entirely.... 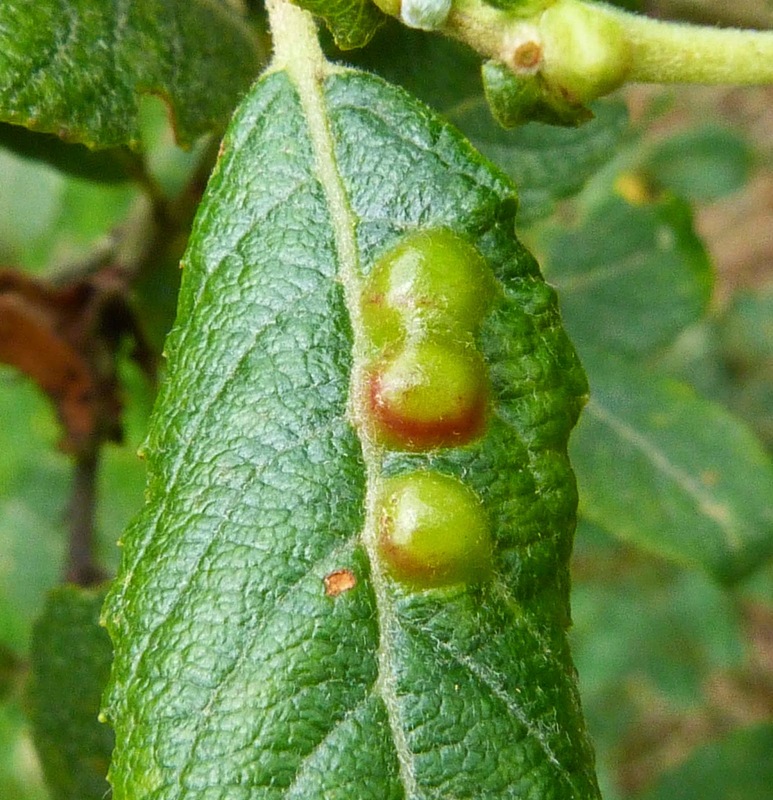 The top photos are example of 'Currant Galls' which are the sexual generation. They are green with varying amounts of red. 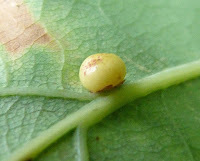 The leaves fall to the ground with the galls attached and the gall wasp emerges in early Spring. 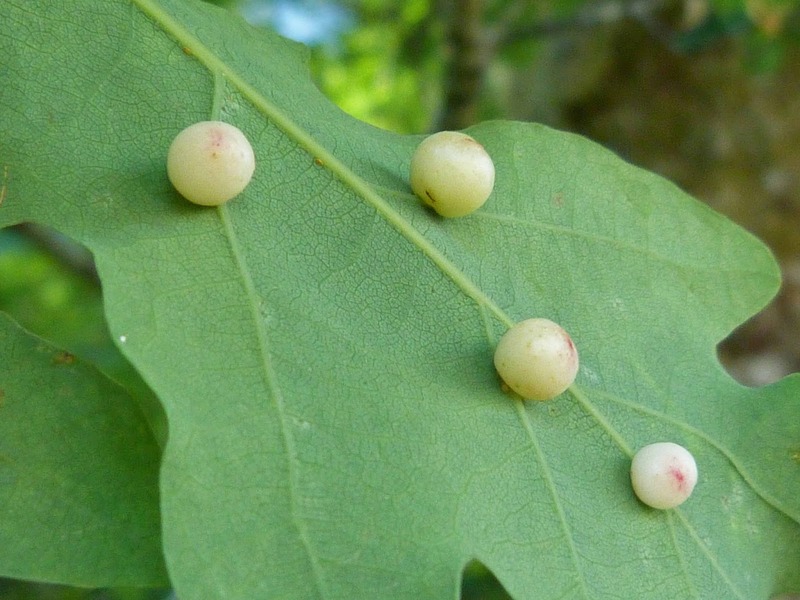 These wasp galls are found on the underside of Oak leaves. 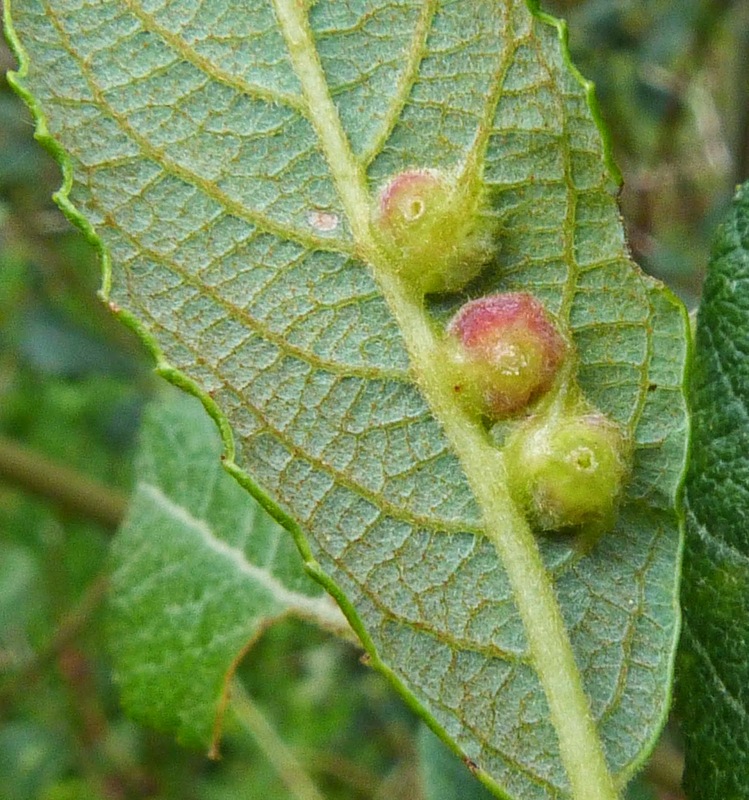 They are far less numerous that common spangle galls (above) and silk button galls (below) which can almost completely cover the leaves, whereas there are usually only a handful at most of these smooth spangle galls on any one leaf. 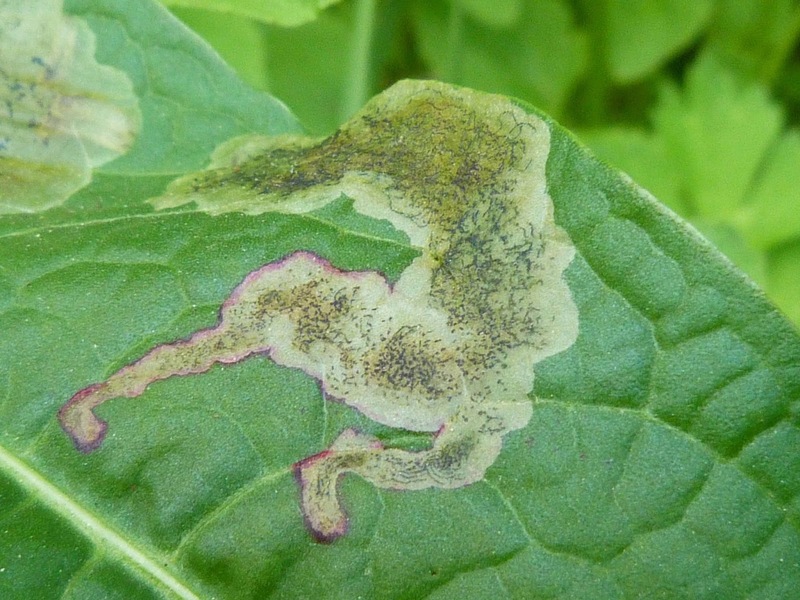 Whilst these ones are whitish or light green with a little pink in the middle and have a flattened shape, they are often dish shaped and can be almost entirely pale green or pink. They are also hairless. 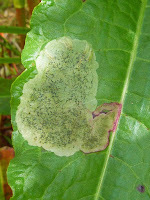 They can sometimes be discovered from the markings on the upper side of the leaf as can be seen in the bottom right photo. 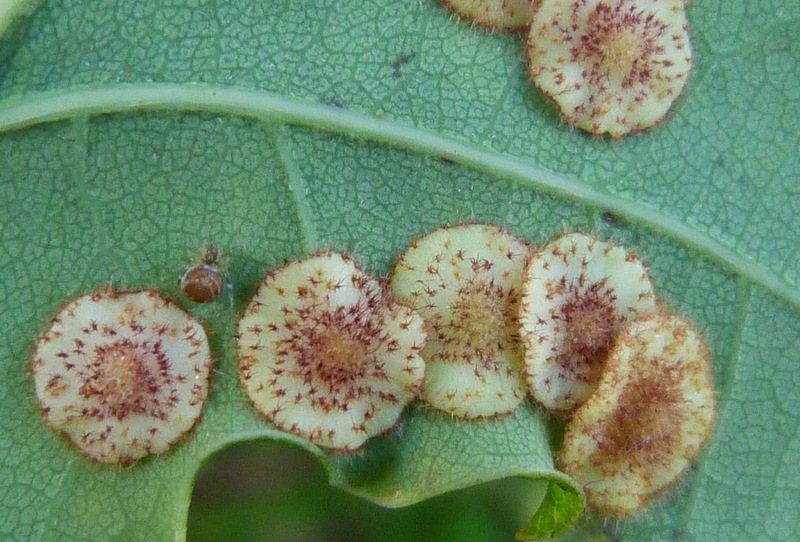 I love the common name of these galls - they did look like silk buttons glistening in the evening light on the underside of this leaf. They are often found near Oak trees, as these were, and have this beatiful golden thread hair-bun appearance. 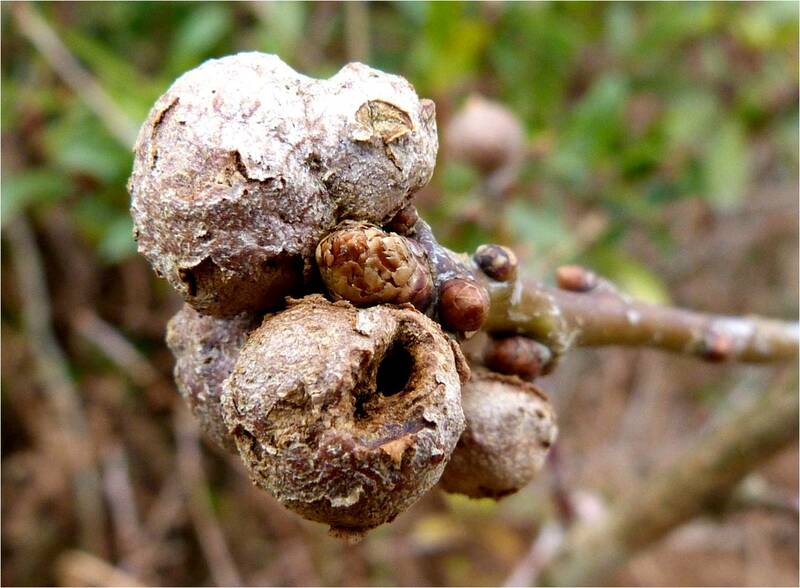 Again, each gall holds a single gall wasp. 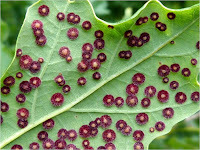 The galls can be very numerous with sometimes over a thousand galls on a single leaf. 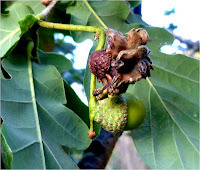 This is the effect the knopper oak gall wasp has on the humble acorn (top photo). 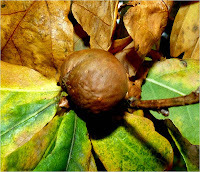 The galls vary from green to bright red and eventually turn brown. 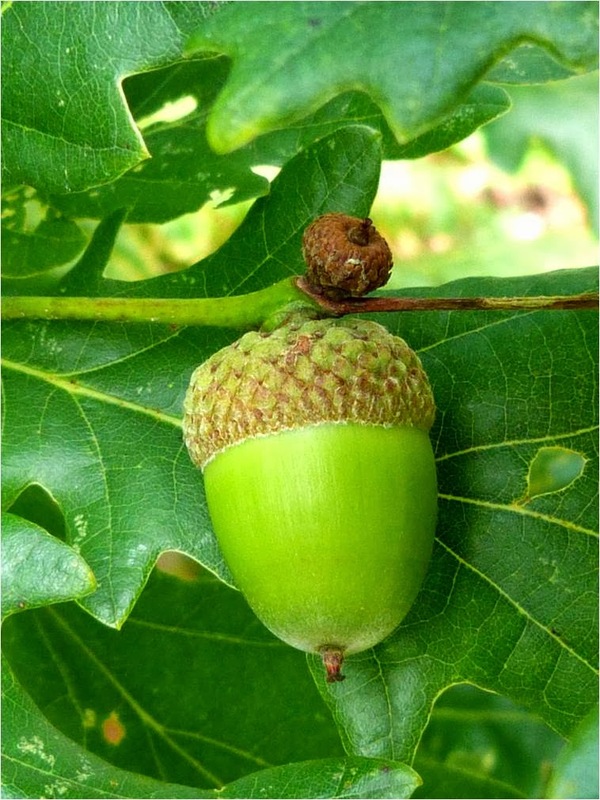 The smooth acorn becomes misshapen and heavily ridged and again each gall houses a single Cynipid gall wasp. 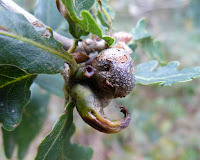 The galls are a lot more obvious and likely to be seen than the knopper oak gall wasp itself. As I understand it, it wasn't so long ago these weren't found in Scotland at all. 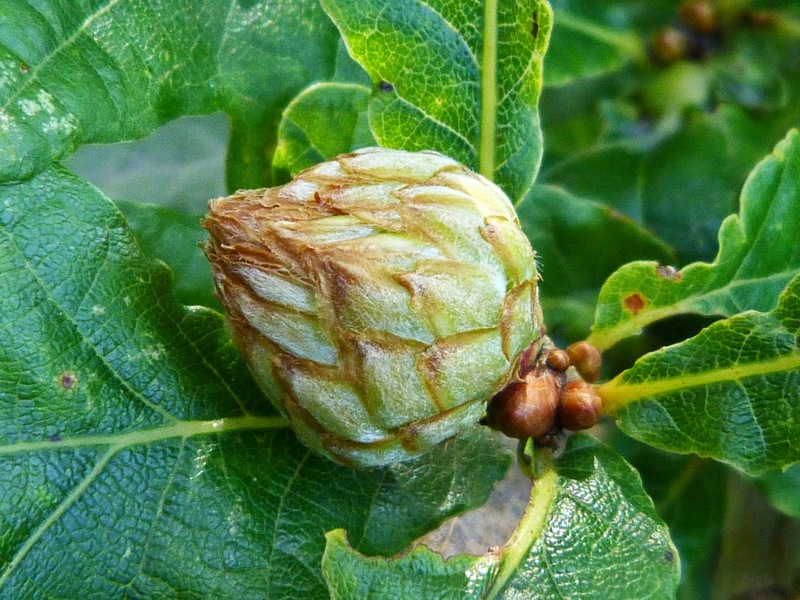 Now, some of the oak trees I find have literally hundreds of knopper galls on them and very few, if any unparisitised (if that's a word) acorns. 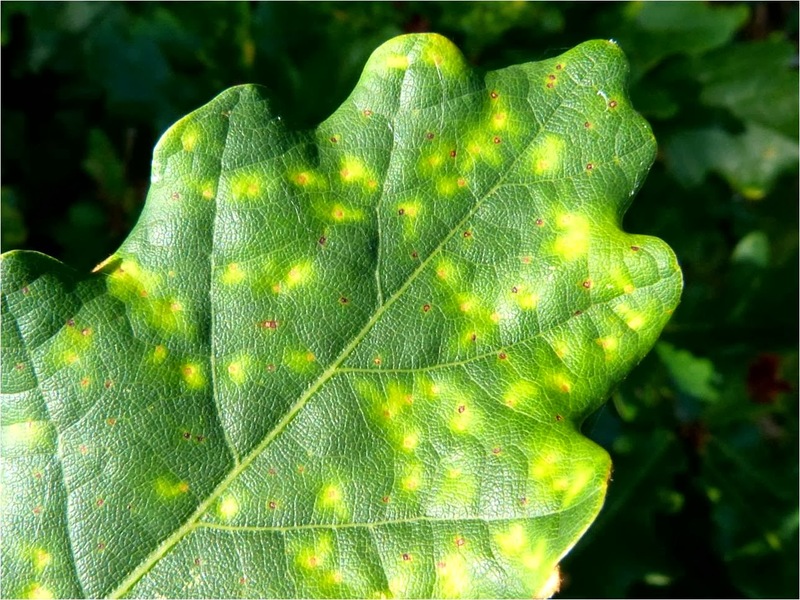 I don't know what, if any, impact this will have on the future populations of oak trees in Scotland. 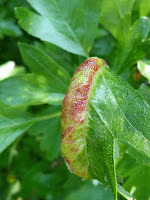 As you can see, these galls start off a stunning greenish-red. 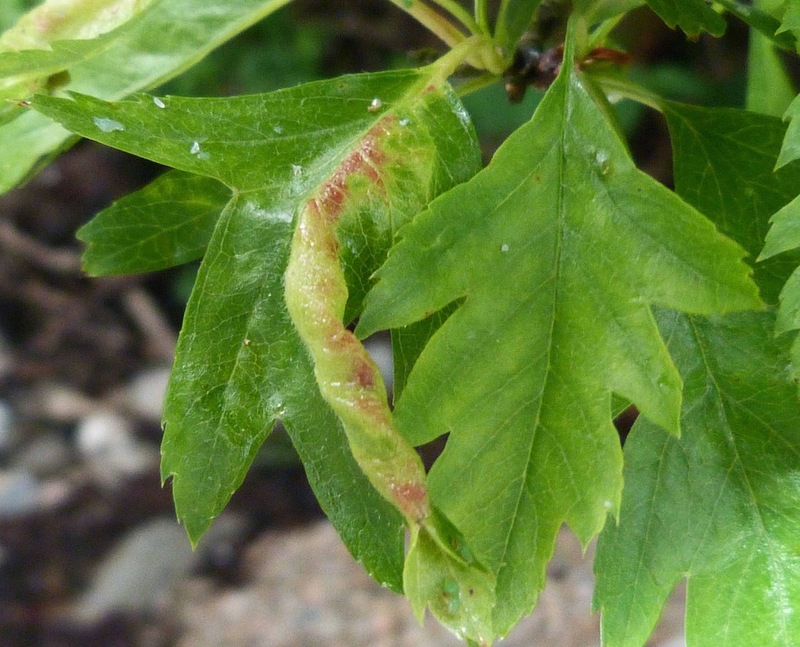 After hardening , they become brown before they drop off the tree in late autumn. The larva overwinters in the gall and will emerge as a gall wasp in early February. As you can see, these galls also start off green and become brown. They normally look quite round and smooth (as in the photos at the bottom), but if they have been parasitised, they are smaller and develop less smoothly. 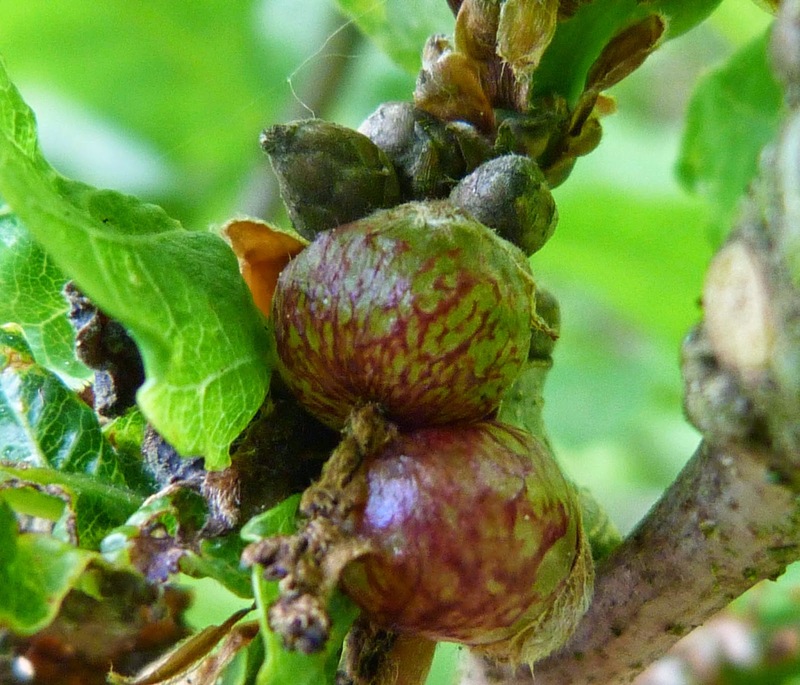 As you can see, the galls in the photo on the top right are decidedly ridged and uneven, and look more like walnuts than smooth marbles. 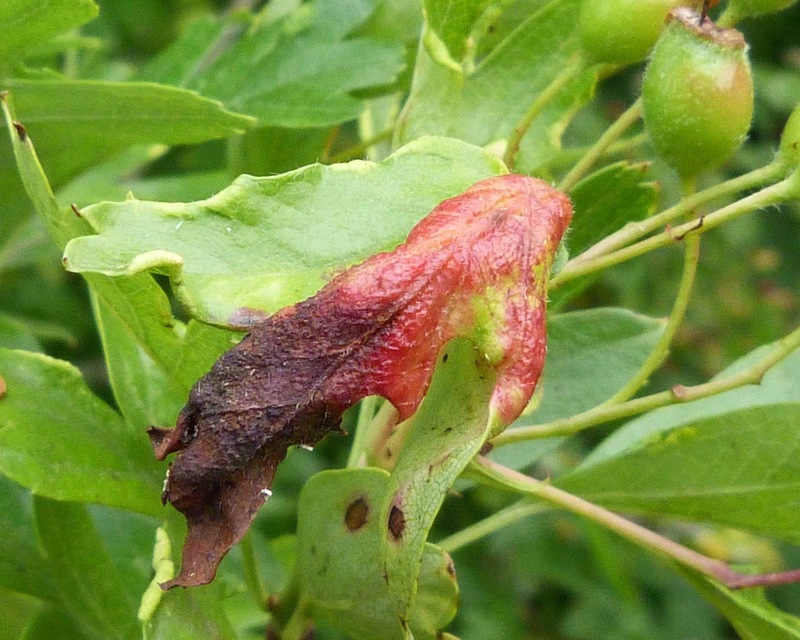 This makes me suspect that these gall wasps may themselves have been parasitised. 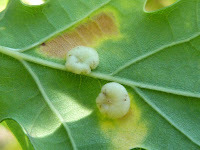 With marble galls (unlike the knopper galls above), the gall wasp leaves by a hole in the gall, leaving the gall attached to the tree (see photo bottom right), although I'm a little confused as each gall is supposed to contain a single larva, and there are clearly a number of holes in the gall at the bottom - which may mean that the smaller holes other non-Andricus kollori parasites perhaps. 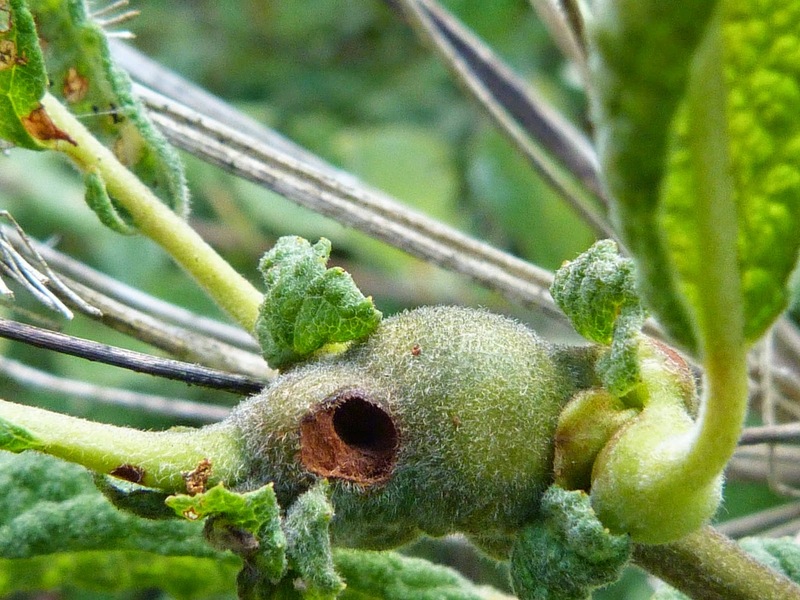 In fact, on further research, I believe the large hole is made by the host gall wasp, but other smaller holes are made by 'inquilines' which are insects that lays their eggs in another's gall, exploiting the gall made by that other insect, in this case the marble gall wasp. 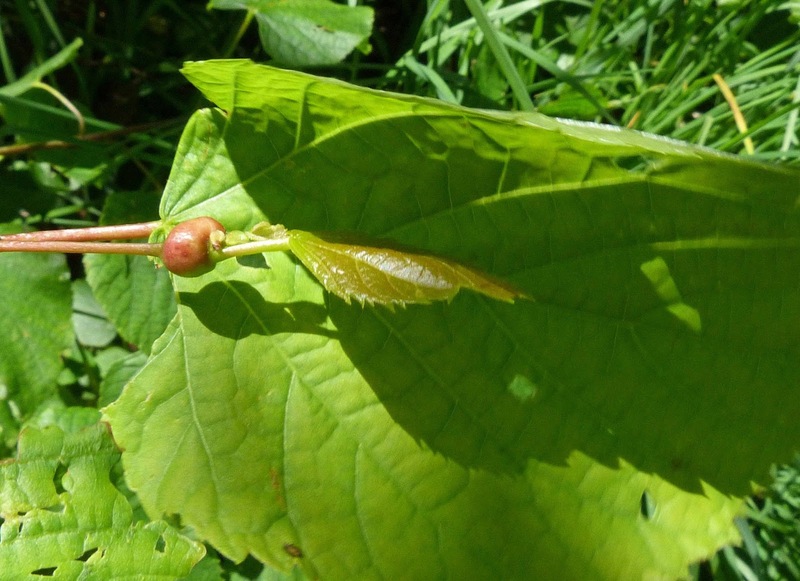 Another interesting story here is that these galls were introduced to Britain from the Middle East due to the large amount of tannic acid they contain and which was at the time used to make ink. 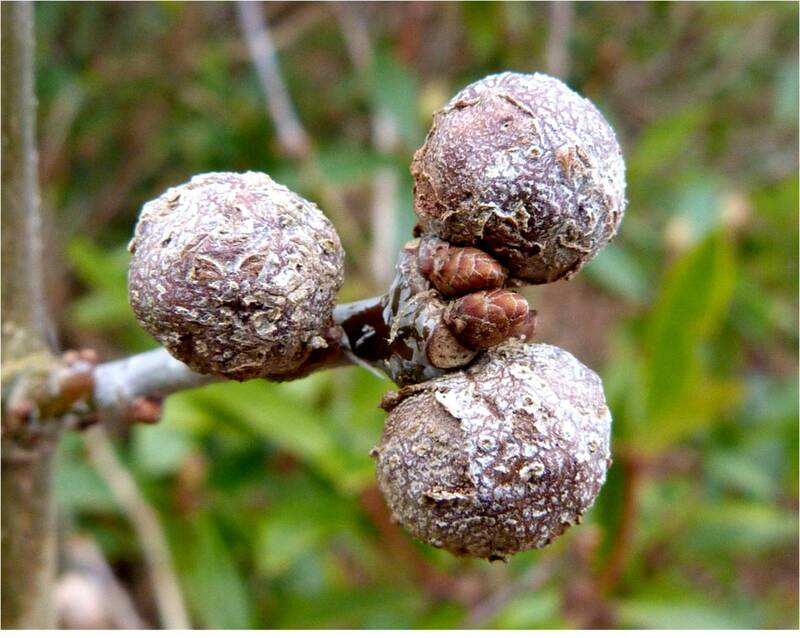 These galls look like smaller, rougher, scalier and more misshapen versions of the larger and smoother marble gall. It is pretty small compared with many galls and is rarely greater than 10mm in diameter. 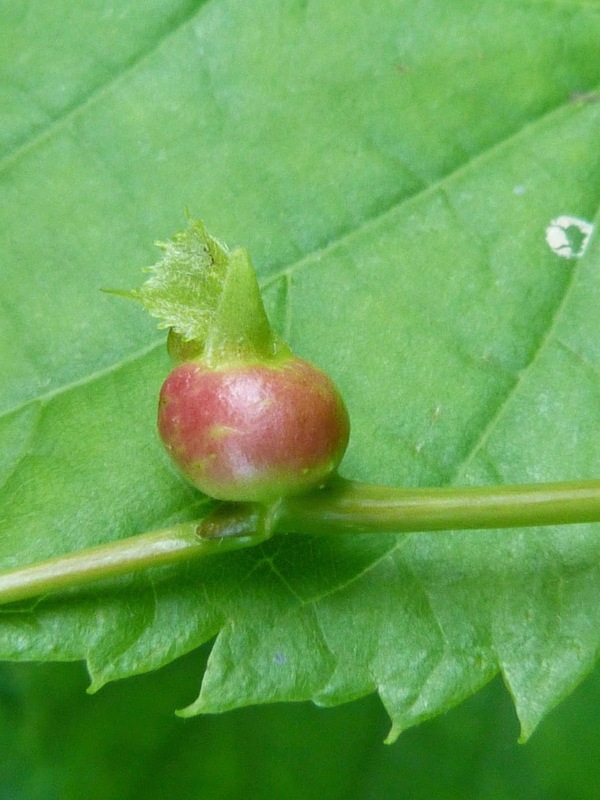 The gall is very hard and contains a single gall wasp. These galls develop on Pedunculate Oak or Sessile Oak trees. See www.britishtrees.wordpress.com for a helpful and well illustrated guide to tree identification. 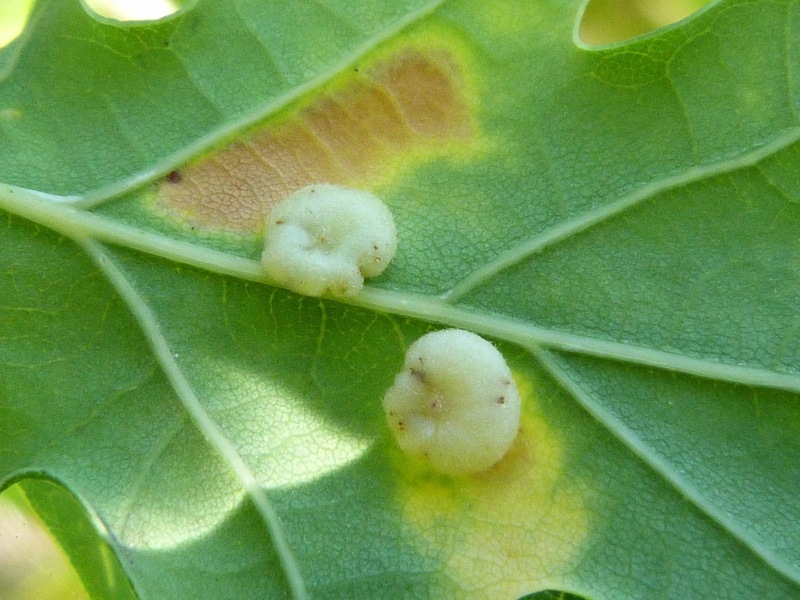 The photo on the right shows where a gall wasp has left its gall, leaving a small and conspicuous hole behind. 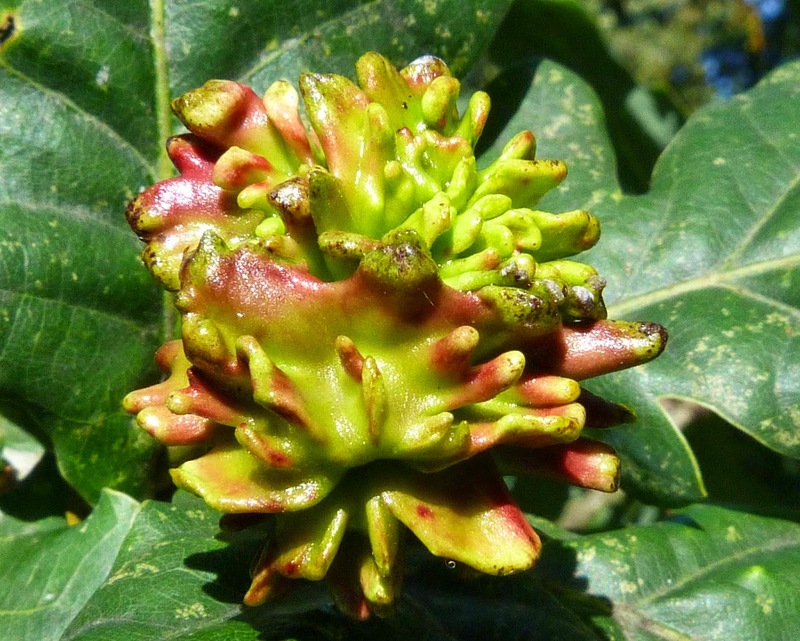 One of the most difficult galls to identify so far, mainly because the examples in books and on the net are all red, but the information on these gall does state that they start off green, become yellow, orange and then a beautiful bright red before turning brown. 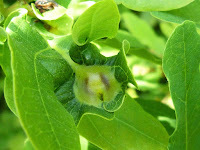 The gall wasp produces the emergence hole as seen in the photo at the bottom. It is only about 4-5mm in diameter and was found on the underside of an Oak leaf in early July. 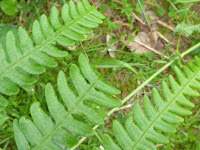 They are attached to the underside of the Oak leaf and there can be around 10 or 15 on any one leaf. 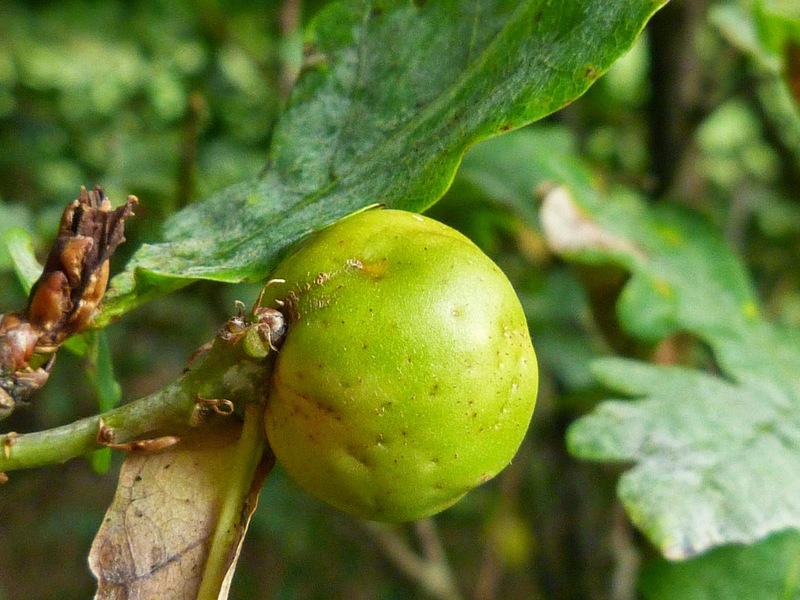 These galls are shiny and slightly flattened and are produced but Cynipid gall wasps. 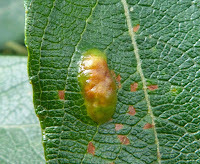 Tiny, tiny gall only about 2-3mms long, so the fact that my micro lens enables us to make out some of the red spots on this is pretty amazing. There are two generations of this gall wasp gall - this Oyster gall wasp which I found in September and the April-bud gall which is found in the spring. 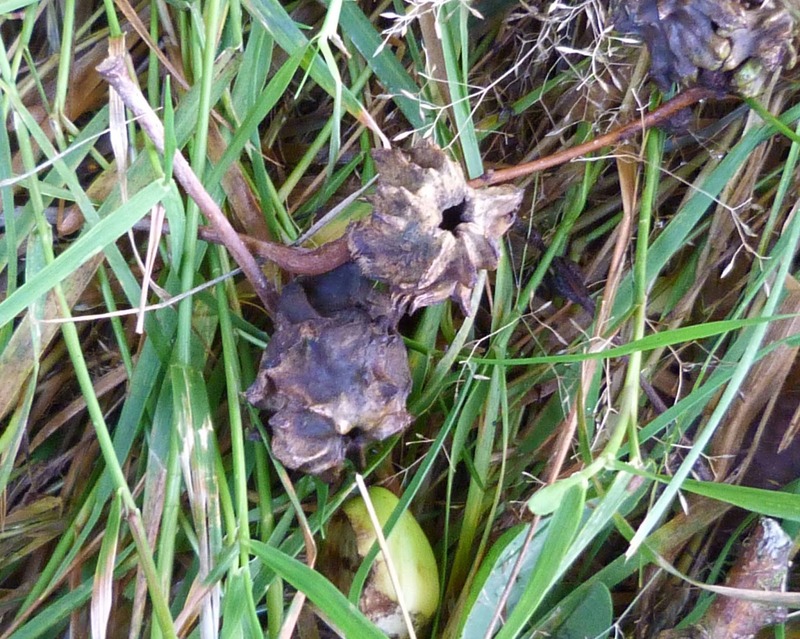 There is however, one very distinctive feature of these galls, which can be seen here, must most easily in the top photos. 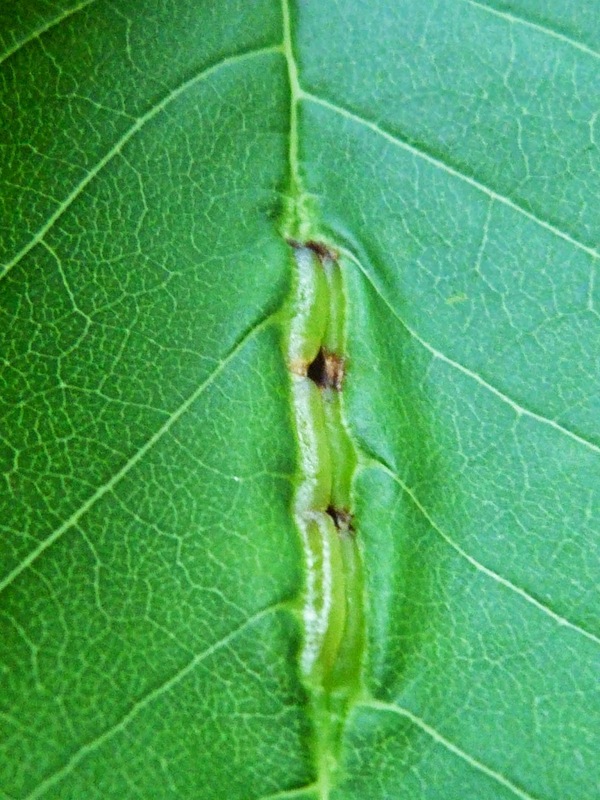 There are flaps of tissue on each side of the gall where it is attached to the leaf's vein. I'm not sure how common this is across the UK, but from the map it looks like in Scotland, it is isolated to the Glasgow and some western areas. I'll need to try and get some better photos, they are really beautiful looking galls close up. This doesn't appear to be that common in Scotland, but perhaps I just haven't noticed it before. Apart from the obvious swelling in the middle, the most obvious feature to me about this gall is the fact that it seems to cause the oak leaf to 'crumple' up which I noticed on quite a number of surrounding leaves. 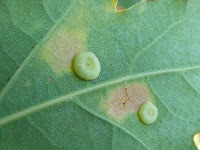 These galls are the sexual generation of the gall wasp and the swelling will leave a hole when the wasp leaves the gall. I'll need to go back and try and get a photo of it. 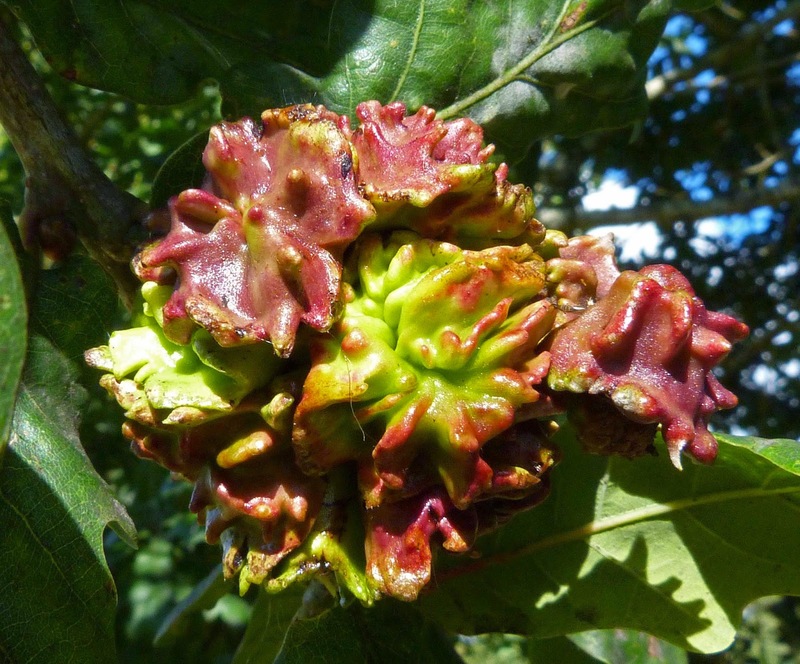 Interestingly, I have never seen this gall before and in fact it was the only one that I could see in a whole row of oak trees. 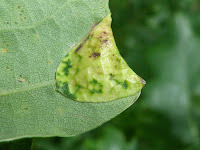 Perhaps this is because the gall isn't that obvious from upper side of the leaf (as you can see from the photo on the right). 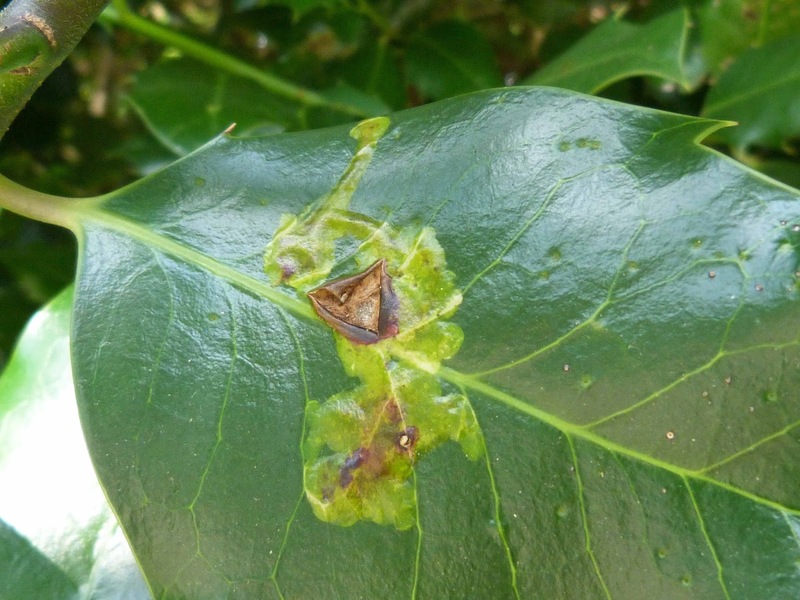 However, when you turn the leaf over, you discover this strange folded and discoloured lobe, almost as if it's been iron onto the underside of the leaf. I'm afraid I can't find out very much about this gall and it seems to have been identified in only a very few locations throughout the UK, including the South West of Glasgow, so perhaps it is pretty rare. 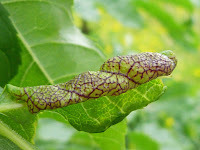 It's been really difficult trying to identify this on, but I am grateful to have received assistance from http://www.ispotnature.org on this one. 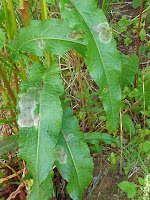 It seems to be the hair in tufts which help identify this particular gall. It was October time when I saw this and the leaf had fallen to the ground. 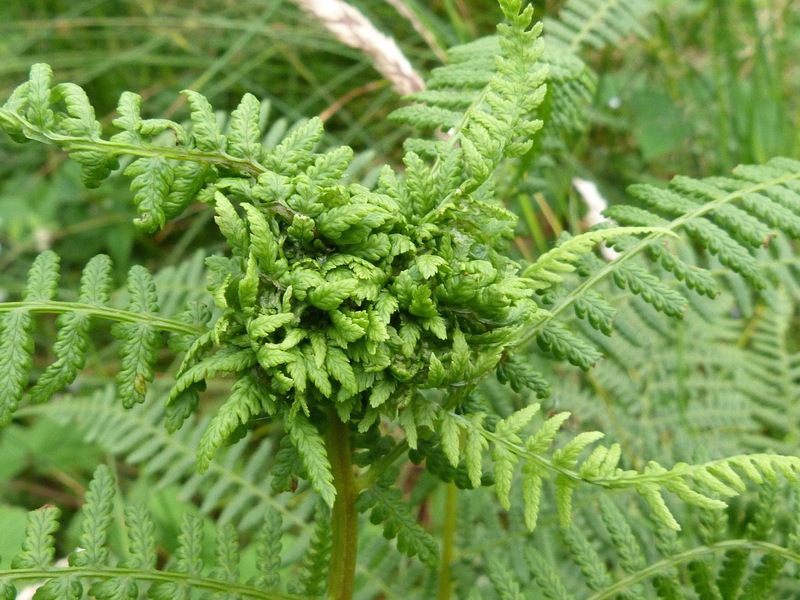 Although this one is a green and brown colour, they can be quite purplish in colour. 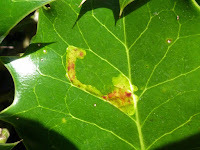 As you can see, it is found on the underside of oak leaves and is caused by a cynipid wasp. Not sure what it is about these galls exactly, but something about them is rather pleasing. 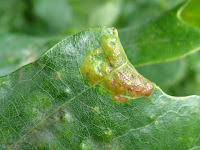 These are the first galls on this page to not grow on oak leaves, but instead they grow on the leaves of Rowan trees. 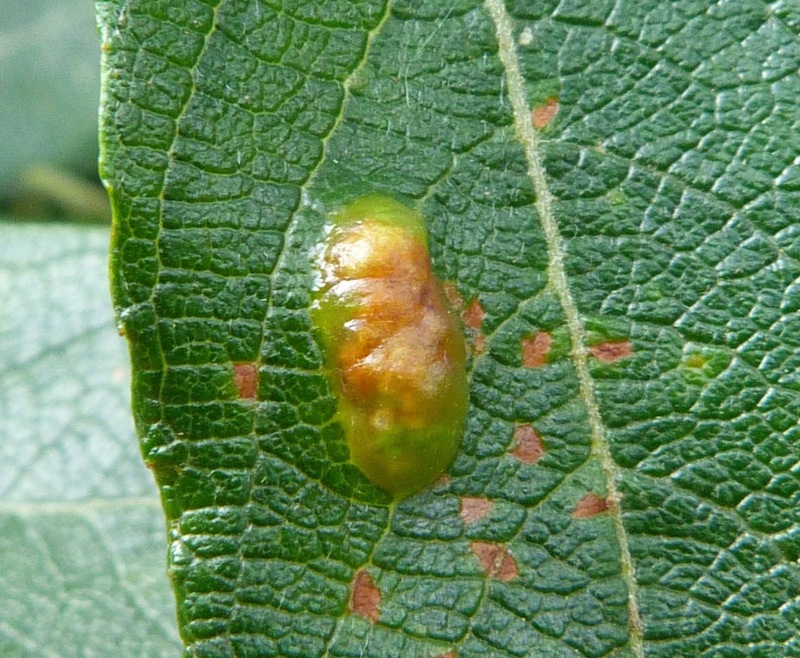 The galls of this species are often 'fused together' (as you can see clearly in the photos on the left in particular) which prevents it being confused with a similar species, Iteomyia capreae. As you can see, the undersides of the leaf (photos on the right) show the galls just as prominently as the upper side and often have the noticeable circle /hole on them. 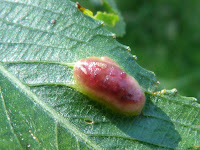 They are tinged with red and each postule holds a single midge larva. 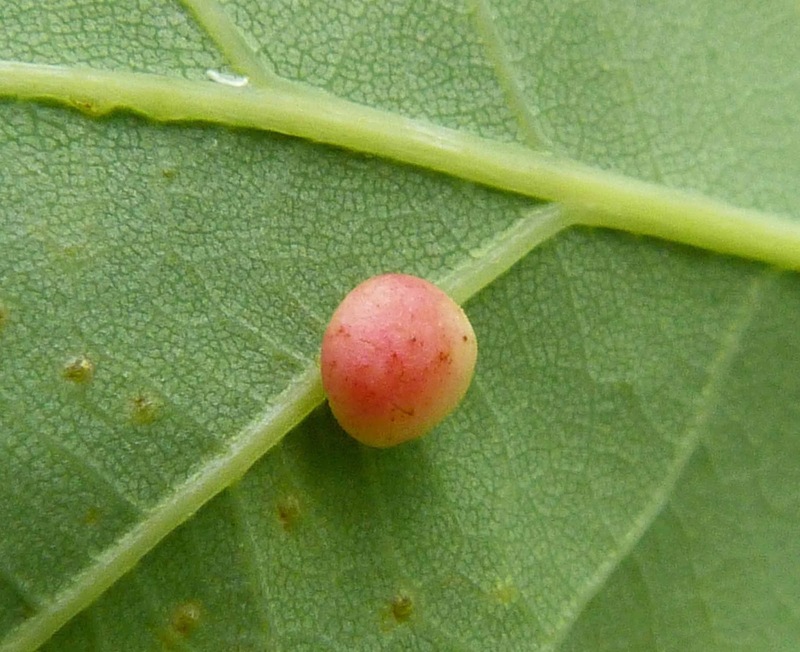 The gall in the middle row is quite green which is how they start off but they turn into bright shiny red bean galls (bottom photo). 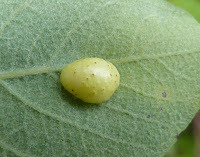 As you can see, the gall can be seen equally on both the upper and underside of the leaf and each gall contains a single larva. 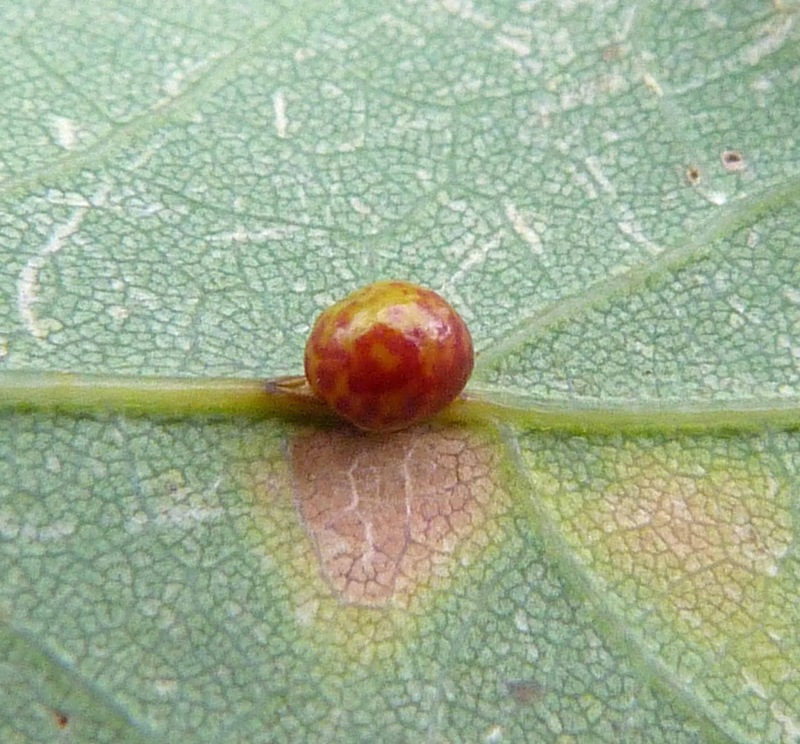 Similar galls form on sallow leaves, but those tend to be closer to the leaf's mid-rib (i.e. 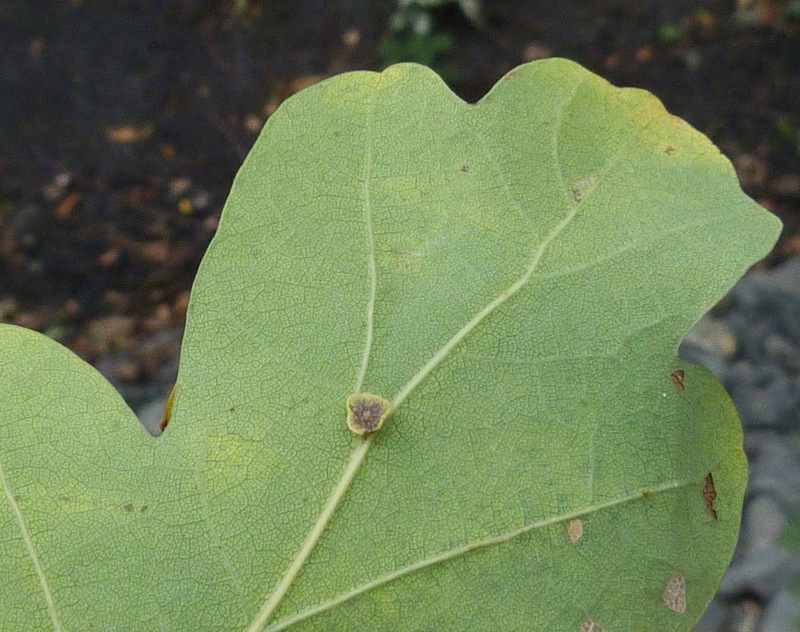 centre line), whereas these galls are quite clearly between the centre line and the edge of the leaf. Pretty exciting to have both the gall and the adult insect of the same species (although there are a number of very similar species, so I cannot be certain they match up exactly). However, these galls are found on Ash trees where the larvae form these beautiful purple-veined galls. 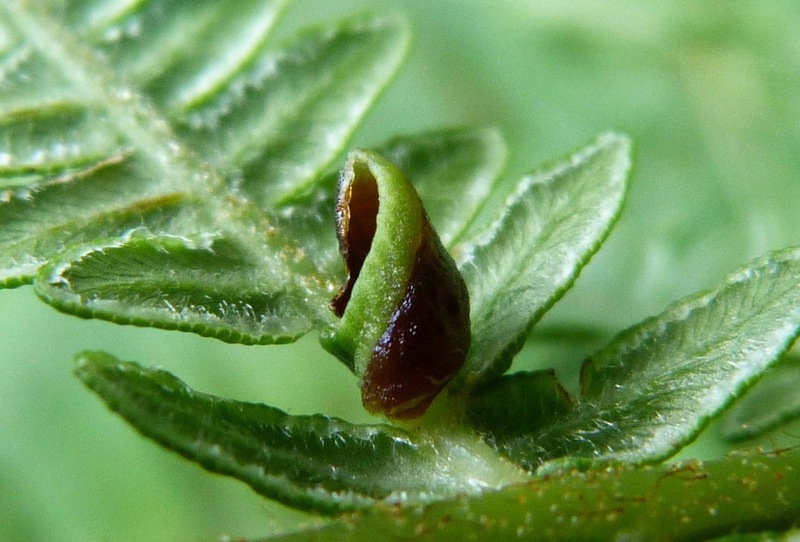 The edge of the leaf curls and forms pouches that contain the nymphs. 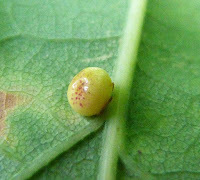 It is one of the more eye-catching galls and again, unlike most of the above galls is found on Ash trees rather than Oak trees. 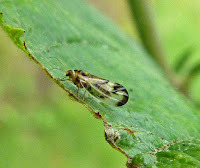 The adult jumping plant louse has these distinctive milky-clear wings with smoky wing tips and the pronotum and abdomen are black and yellow. The picture on the top right in fact shows the gall and the jumping plant louse, although I think it is an adult, rather than a nymph just leaving the gall. Still pretty exciting I think to have both in the same photo. 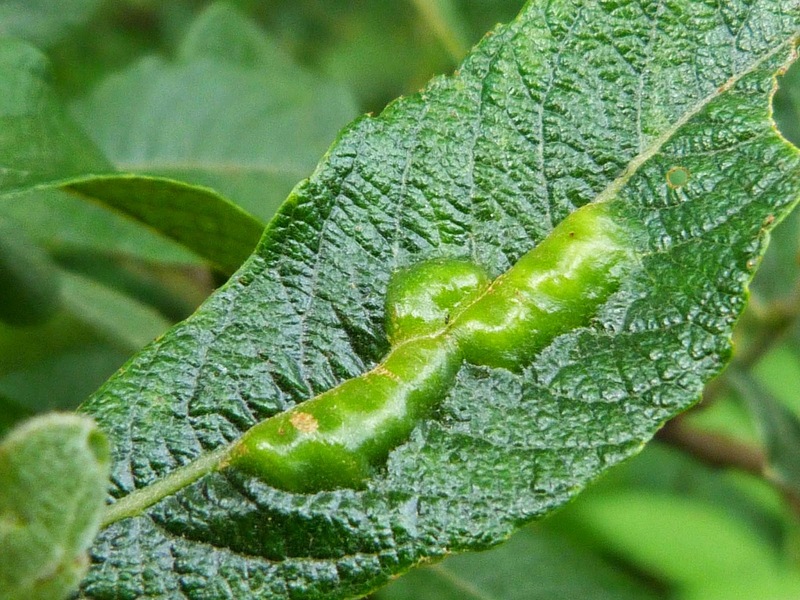 These photos show the midge gall on the upper and underside of an Ash tree leaf. 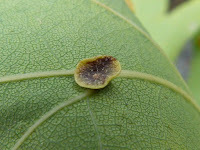 As you can see, the gall forms on the main vein of the leaf. 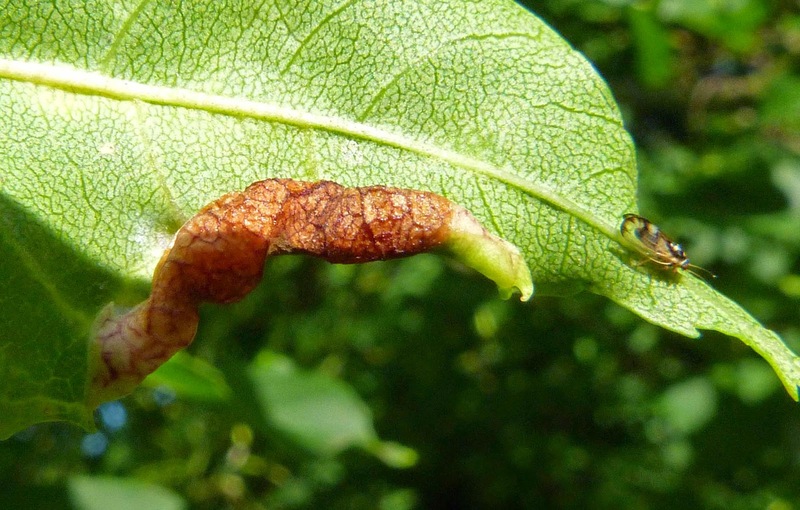 Tiny yellowy orange caterpillar-like larvae are produced from this gall. 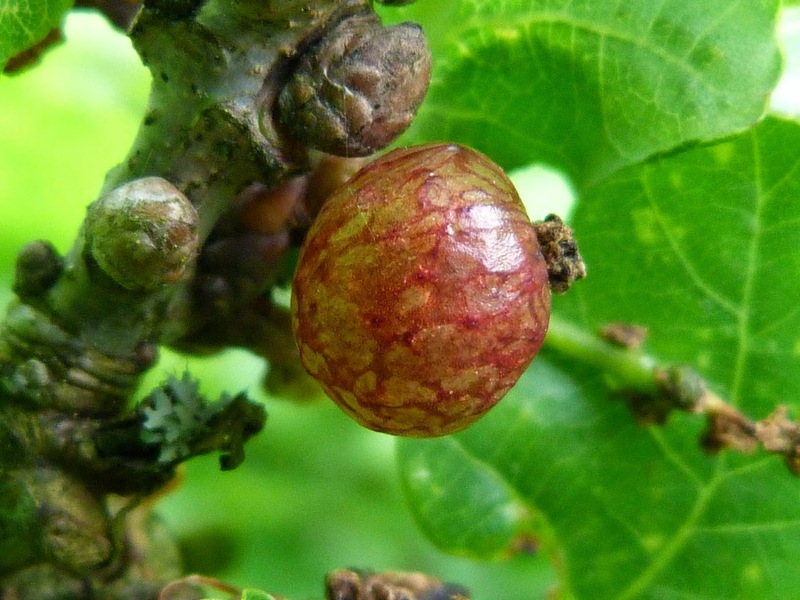 Ok, so the top photo looks pretty convincing, but I am not so sure about the two photos as the bottom, because although they were definitely found on hawthorn, the other examples I have seen of this gall are like the top photo i.e. much brighter red than the bottom two. 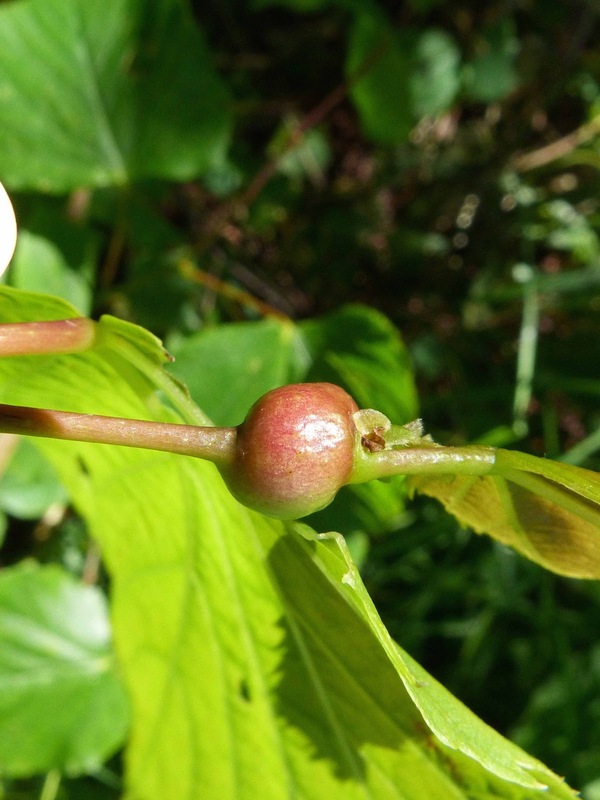 Still, I'm quite convinced this is a gall, and there aren't that many hawthorn galls, so I'm sticking my neck on the line with this identification. 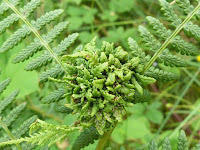 It reminds me a bit of the ash tree gall, Psyllopsis fraxini (see two above) but without the 'veins'. 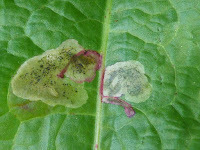 I might send them into ispot http://www.ispotnature.org for identification, if they haven't got fed up of me by now. I can't be absolutely sure I have identified this correctly, but it is certainly the closest match I can find. If anyone knows differently, I'd be very happy to correct it. 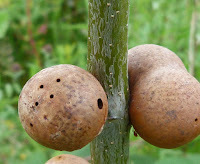 To me, the interesting features of these galls, are that they appear to be conjoined and are situated on the stem of the willow tree. 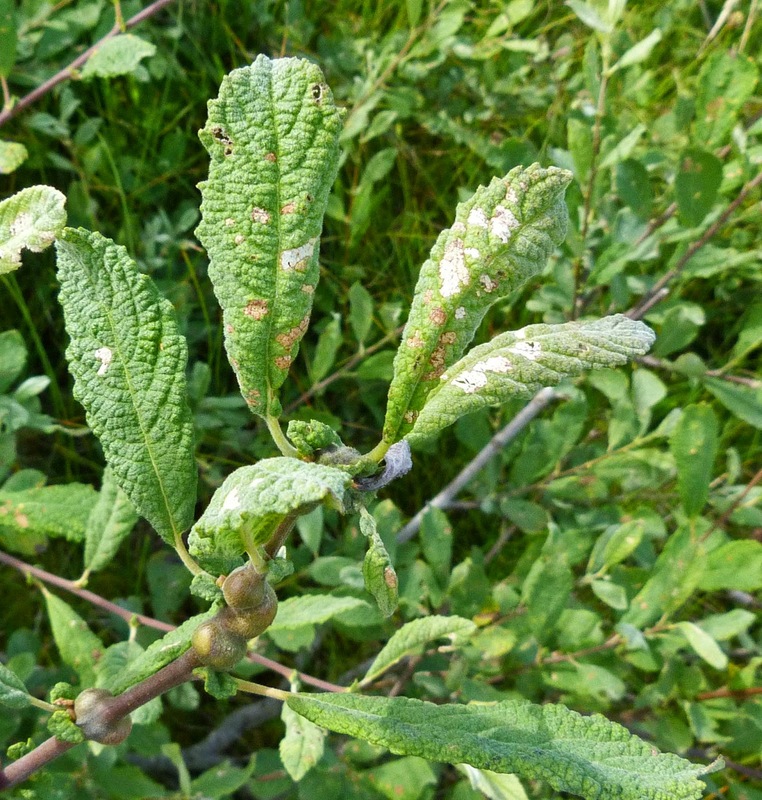 I have photographed the willow tree (which I think is eared willow (Salix aurita)) as this may help identify the gall causing insect. 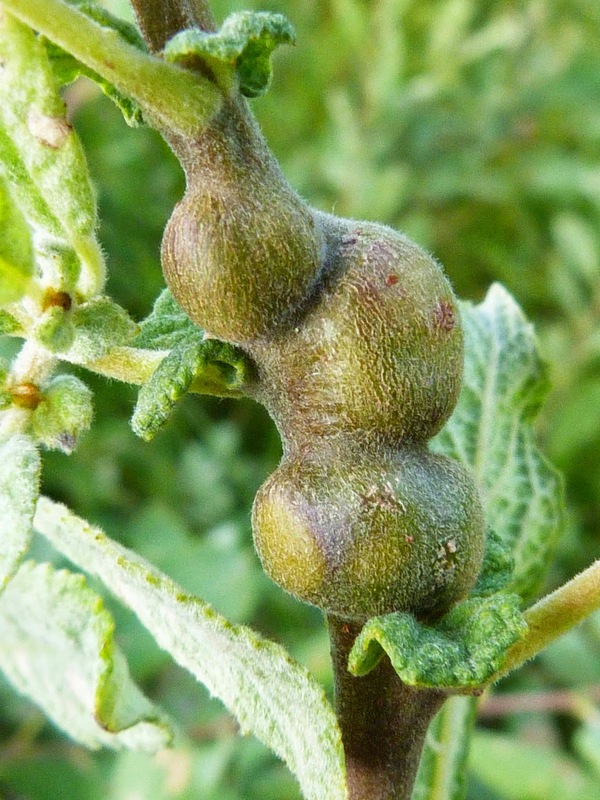 A rather attractive gall I think and found on the Isle of Mull. In truth, I'm not entirely sure this is the right identification, as there seem to be a number of galls that blacken the leaves, known as pinnulets, of bracken. 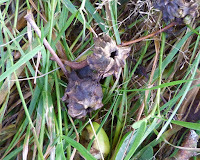 They are called little black pudding galls because they are black and sausage shaped - they apparently blacken over time, which may be why this one still has some green still round it. 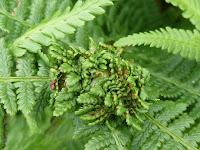 This was found on the underside of bracken and as is often the case with galls, the galls themselves are more likely to be seen than the adult insect. 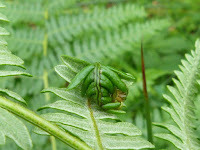 The photo at the bottom shows the bracken from above and as you can see, it just looks like the tip of the bracken frond is missing - is not obvious at al that there is a gall lurking underneath. 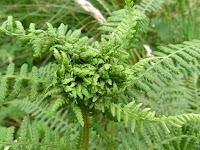 It is only when you turn the fronds are turned over, that the distinctive curling of the tip can be seen. It looks like a crooked, arthritic and gnarled hand to me. 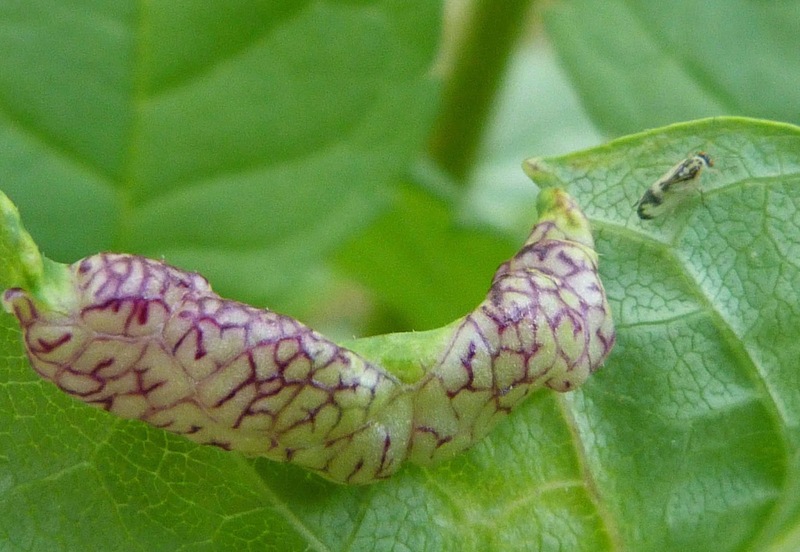 The curling is caused by the fly larvae tunnelling into the centre of each little 'sub leaf'. 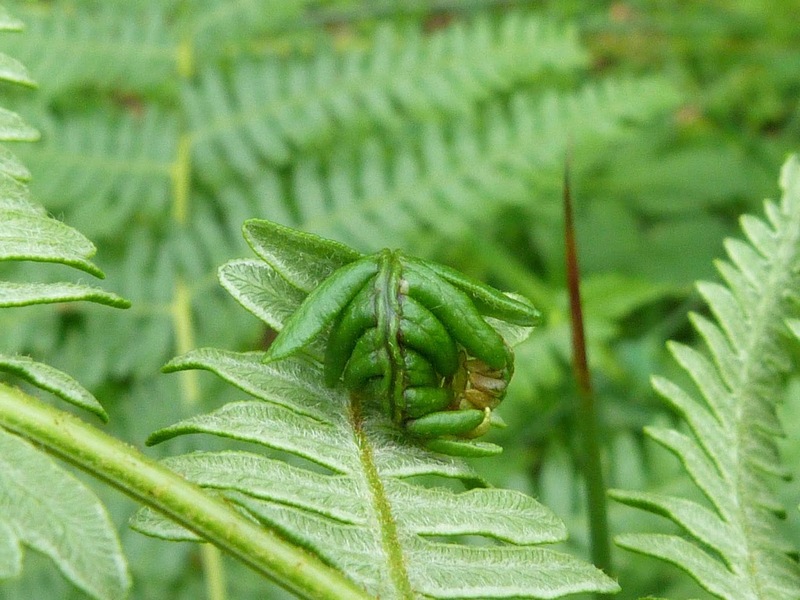 This looks like the ferns have been wrapped up into a tight knot - in fact I've seen this referred to as the 'knotting gall' which seems very apt. I don't think they are terribly common across Scotland or in the UK for that matter, but interestingly, in Glencoe where I found this one, they were everywhere. I feel this is pretty distinctive and can't really be confused with anything else. Some of them seemed to be all green whereas others were speckled with brown. 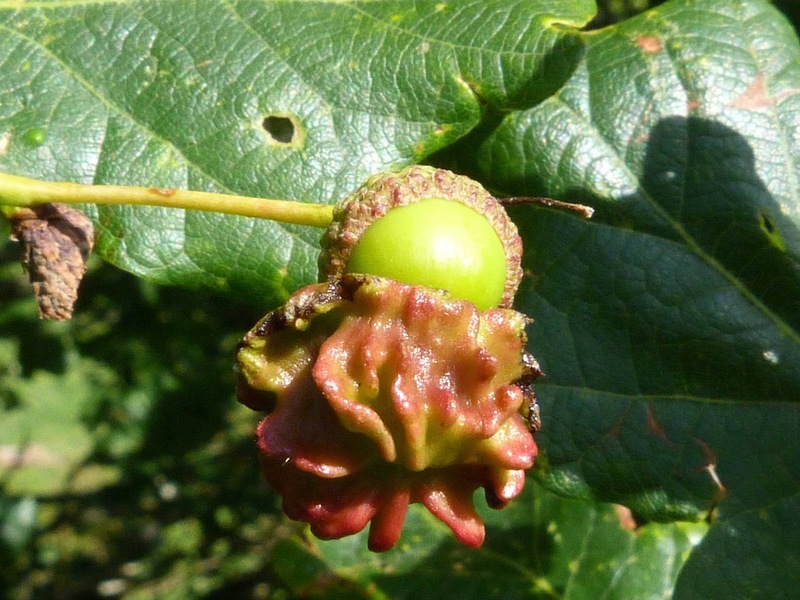 It also seems to me to be a bit unusual that this gall was caused by a fly (a little innocuous grey one apparently) as most galls seem to be caused by gall wasps or midges. Something rather captivating about this one for some reason - the way you can see how the fly larva moved around ('mined') and where it surfaced and left the leaf. As you can see, this species is found on holly leaves where and the gall formed is yellowish with a reddish-brown splurge in the middle. 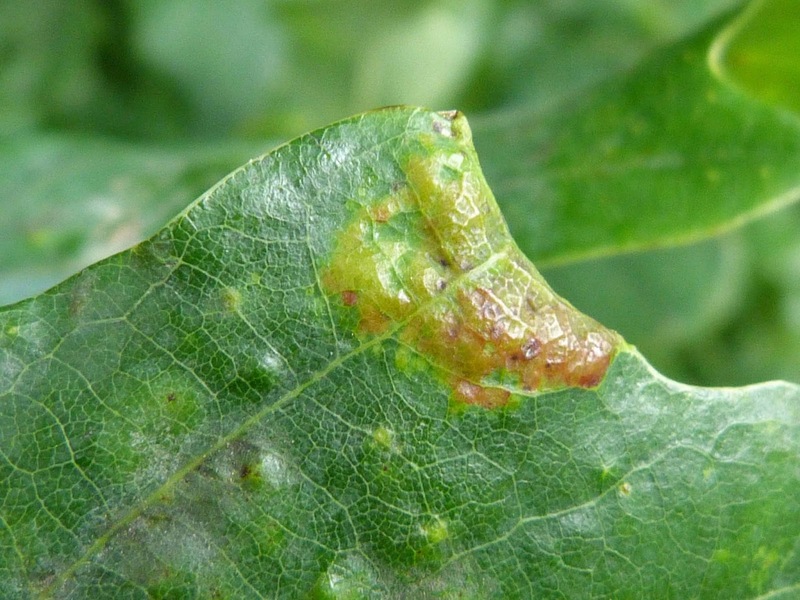 In Scotland at least it is abundant - look on almost any holly bush and you will find a number of these leaf mines. Apparently this is the only miner found on holly. 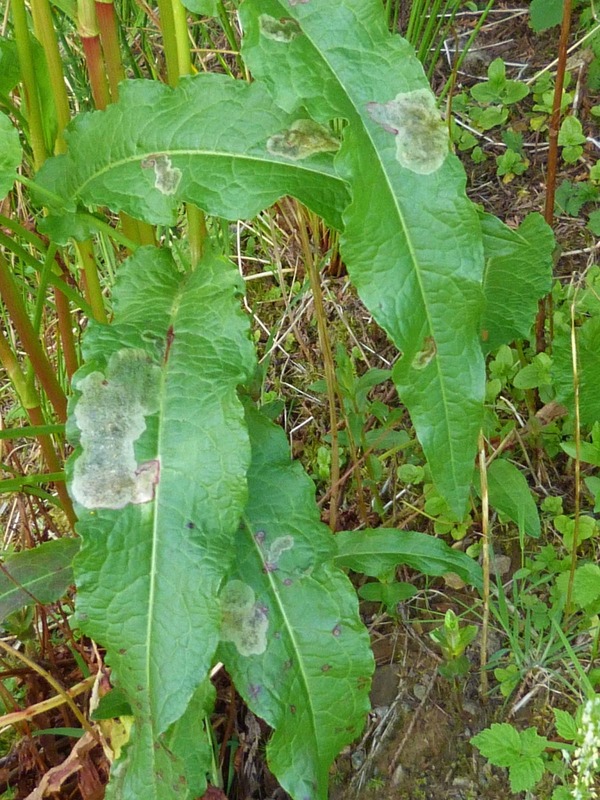 The larvae of this fly mine broad-leaf dock leaves. These mines are rather ugly looking and almost look like a plant fungus rather than larvae mines. The dock leaves have these very distinctive large whitish patches with black dots and reddish trails. I submitted some of these photos to http://www.ispotnature.org and they tended to agree it might be this although the tunnels you can see here aren't typical. They told me that the black dots are 'frass' which is waste product from the larvae and that you can actually see the white larvae at the top of the leaf - see the top photo on the left. 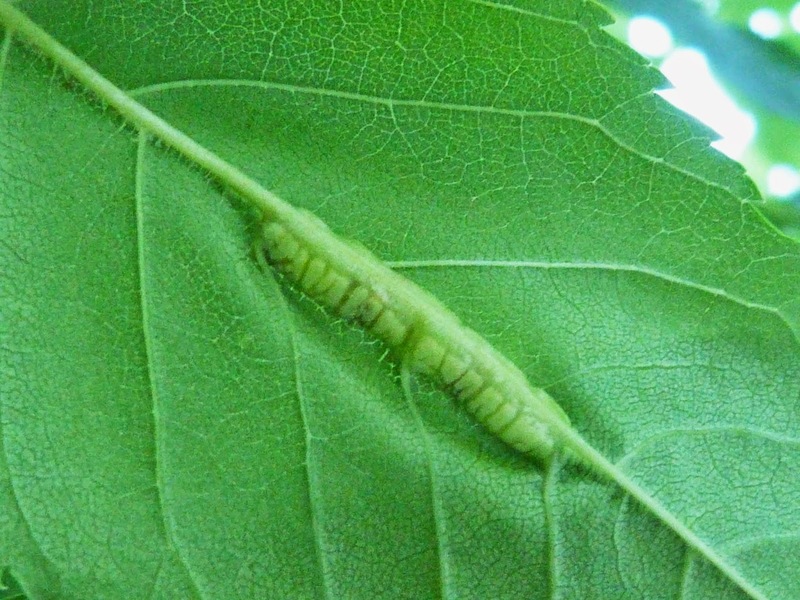 As you can see, the larvae seem to be almost lined up together and apparently this is fairly typical as they commonly feed shoulder to shoulder. I'm still not absolutely certain about the identification of this as all maps for this species have only identified this species in England - there appear to be no record of it at all in Scotland, which I think must be unlikely as they are widespread in Argyll just now (end May 2016). 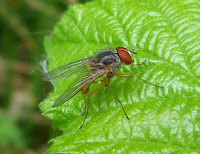 Please note that the fly at the bottom is a Pegomya sp. 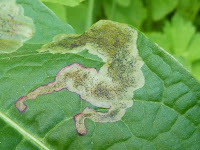 and it's larvae mine dock leaves like the ones here, but the species of fly can't by identified without being examined. 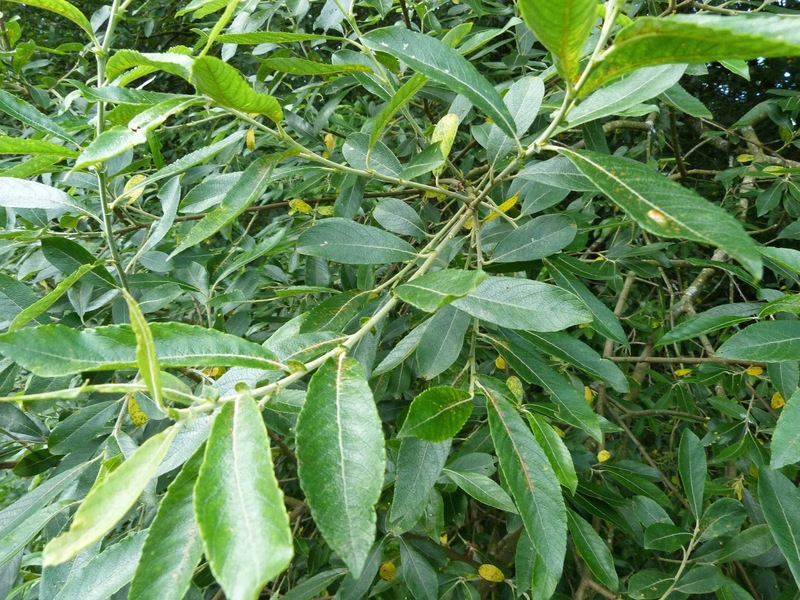 Eupontania is sometimes given the full genus, meaning sometimes it is known as Eupontania pedunculi. 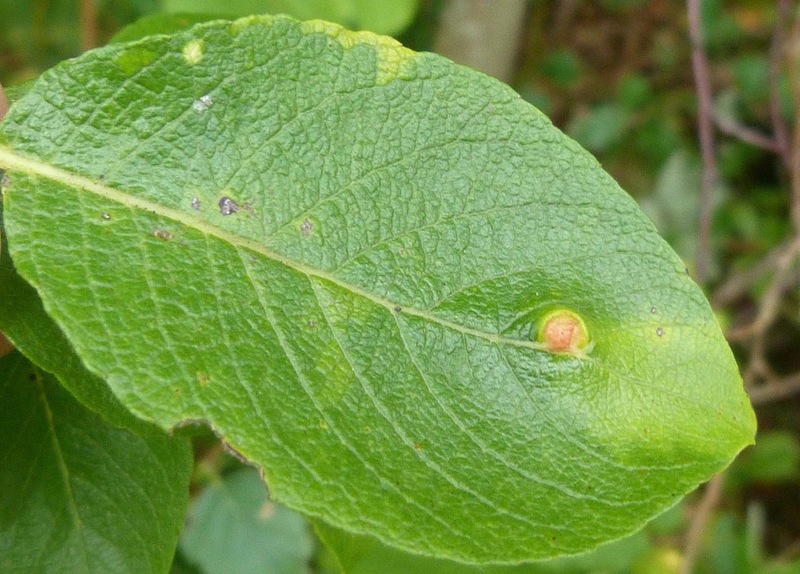 I understand the position of the galls can vary depending on what type of sallow it is found on, with some being positioned nearer the tip of the leaf whilst others are found more in the centre of the leaf. 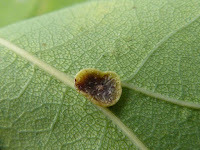 The photo on the left shows the gall on the underside of the leaf. The little yellowish-red nodule on the top of the leaf (in the photo on the right) is a tell-tale sign that there's a fat juicy gall below. 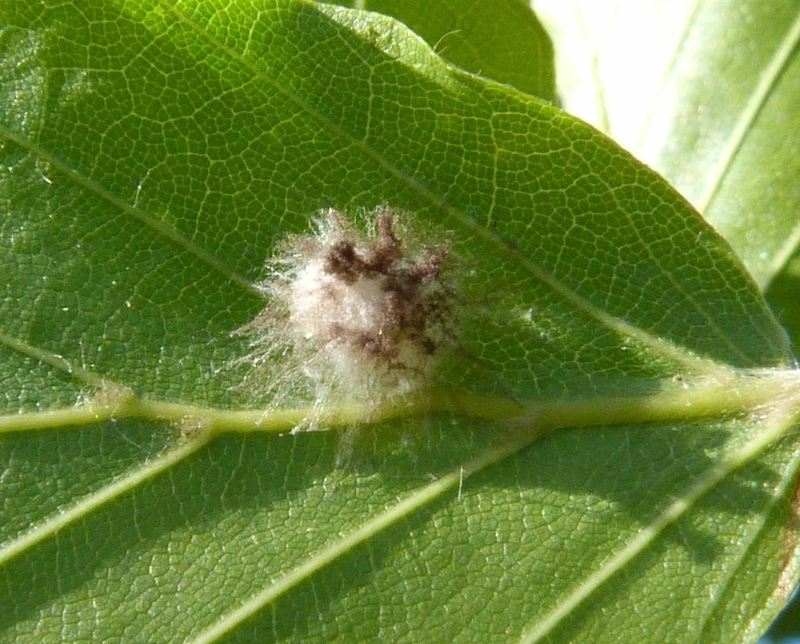 I keep seeing these strange woolly balls attached to leaves and couldn't work out what they were - I didn't know if they were galls, cocoons or fungi, particularly as the type of leaf I found them on seemed to vary. 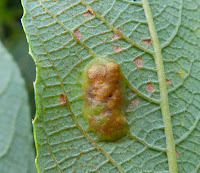 Eventually, I could take it no more and put the photos on http://www.ispotnature.org who suggested (after some confusion on my part about what plant they were found on - I understand these are sallow leaves) that it was the same as the gall above Pontania (Eupontania) pedunculi. However, someone else on ispot thought it was too hairy to be this - so the identity still wasn't certain. Then recently, Jill Cunningham at the DTNFC posted (see bottom of this page) that this is in fact likely to be the egg sack of the Stretch Spider/Long-jawed Orb Weaver, tetragnatha sp. 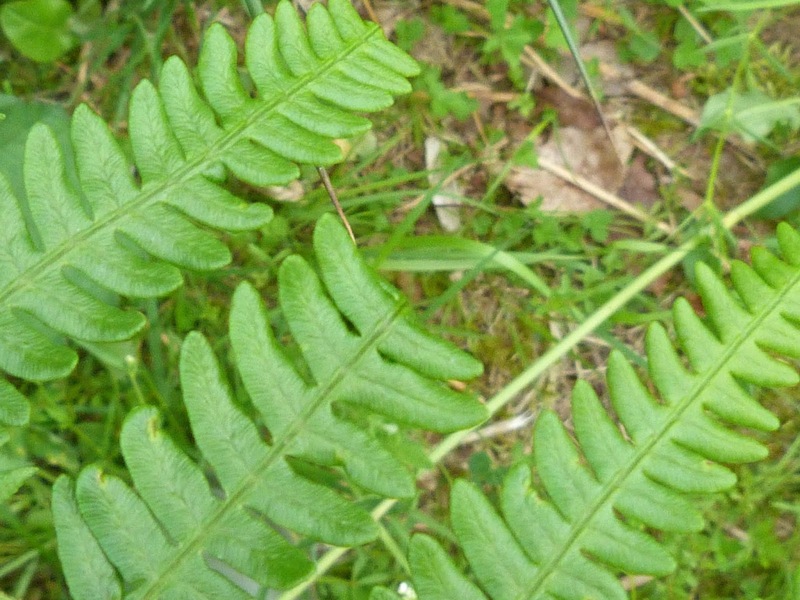 (t. extensa). She explained that she had found them on Sallow and Reed at 2 river/pond sites near Darlington and they had taken a long time to Id. Glad it wasn't just me! 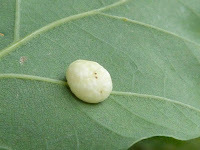 She also explained that they camouflage their egg sack to look like mould or bird droppings. Many thanks to Jill for sorting out the confusion! 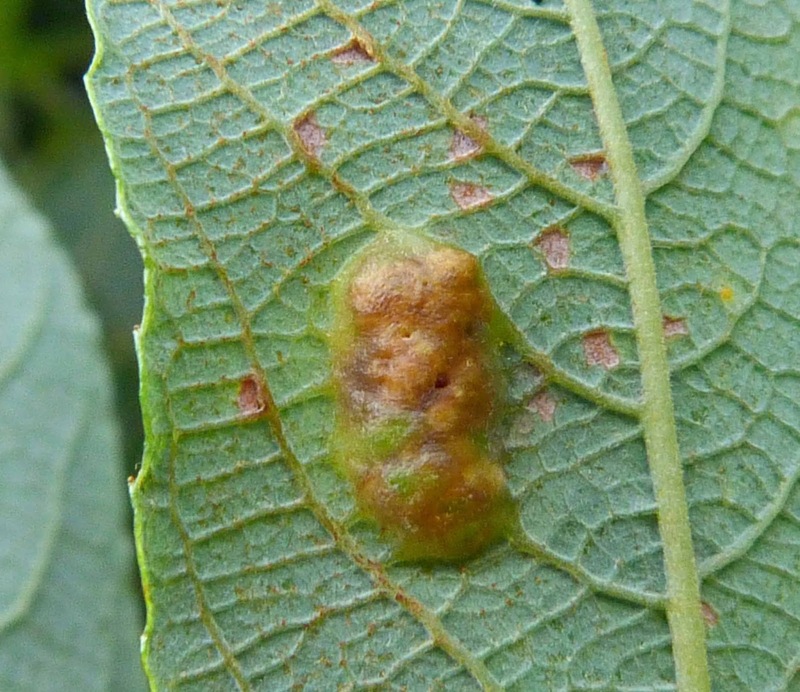 Unusually, this gall was found on a lime tree and on the leaf stalks rather than on the leaf itself. There were quite a number of these dotted on the lime tree and each was about 1cm in diameter. 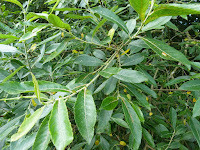 As you can see, they are reddish and green and at first I wondered whether they were the tree's fruits. 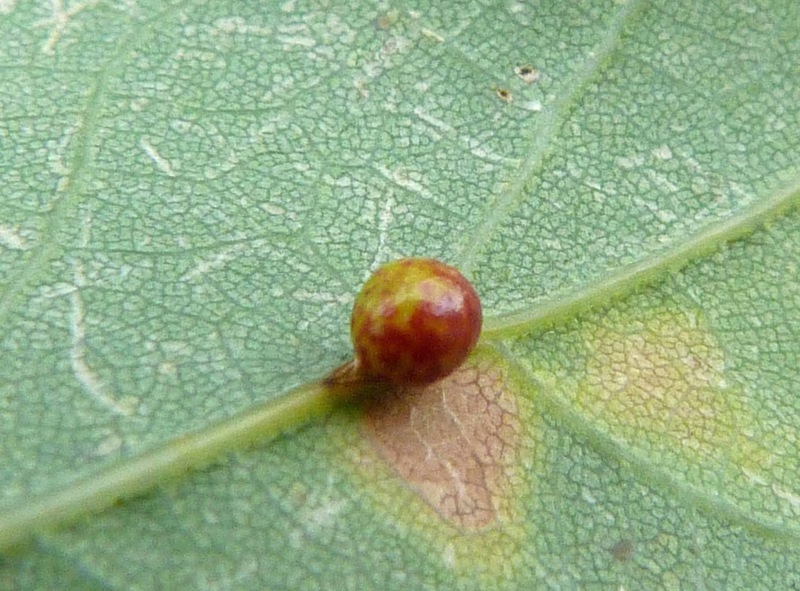 Often the galls start off green or a paler red than the ones you can see here. 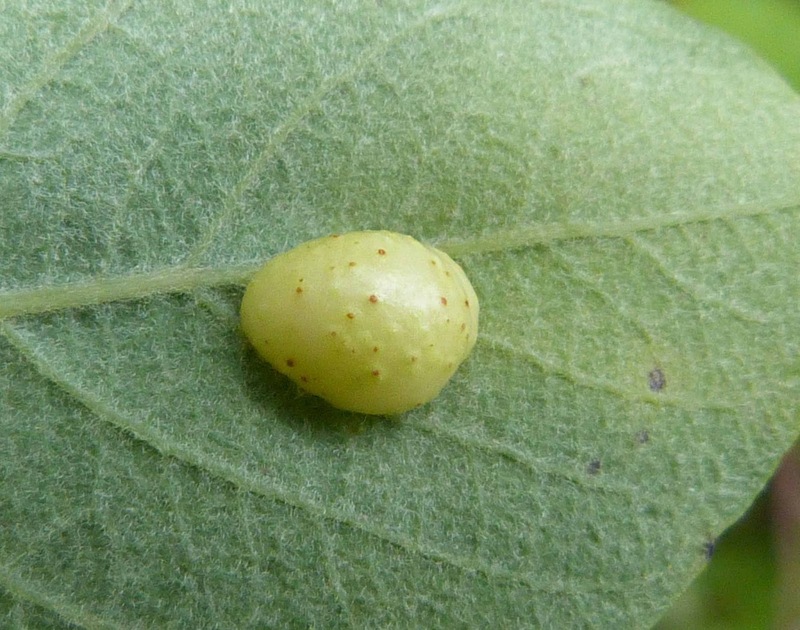 Each gall contains a single yellow midge larva. According to Michael Chinery's 'Briatin's Plant Galls', if you were to expose the larva, it would wriggle around furiously. Needless to say, I didn't try it, but I'll take his word for it. First thing to note is that this was found in Nottinghamshire in England and not in Scotland at all. In fact, these wasp galls can only be found around the southern part of England, so I should not really be including it on this website. But now that I've found one and photographed it, I thought it would be better to include it than not. 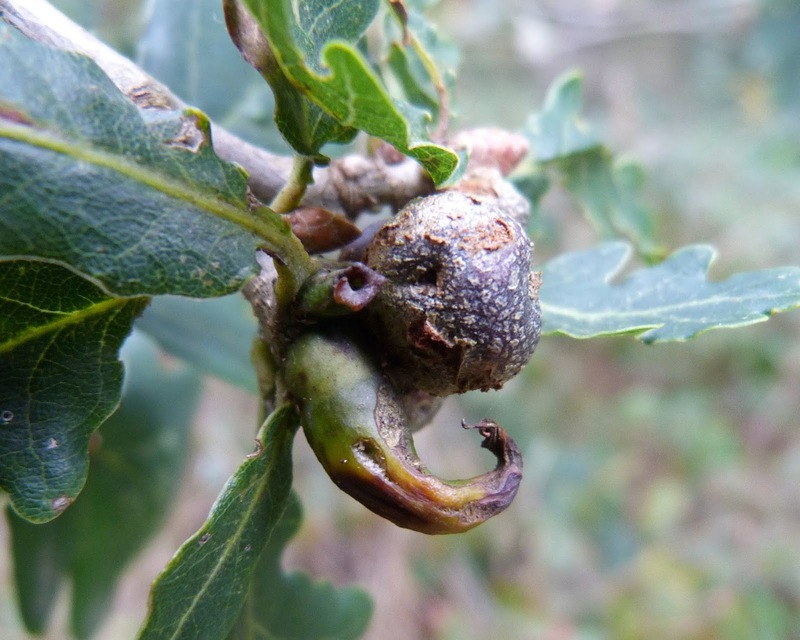 Firstly, this gall is found on oak trees and is called a rams-horn because it often has two curved green or yellow protrusions that look rather like a ram's-horn - as nicely demonstrated here. The horns can often be much longer than the one here and turn darker and more woody-brown as they mature. This gall is actually right beside a cola-nut gall (see above). Bracken Fly Gall is Chirosia grossicauda, I believe. Thanks for confirming that Stephen. I am a researcher at the University of Toledo and I work on insect-induced galls. We are in the process of publishing a scientific article showing that insects hijack plant flowering pathways to induce their galls (preprint here: https://www.biorxiv.org/content/early/2018/08/02/383851). 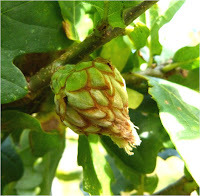 We would like to use the photo of the artichoke gall (left one) that you have in this post for one of our figures. If you took this photo yourself, do you give us the authorization to use it with proper credits? If you didn't take it, could you either tell me who did or forward my email to the right person? - Must explicitly state permission is granted to us (Macmillan Publishers Ltd, part of Springer Nature), to publish the image under a CC BY open access license. - Permission must be granted to publish the image in all formats i.e. print and digital. If you agree, could you send me an official authorization to use your photo at melanie.body [at] utoledo.edu? Your 'grey gall thing on a sallow leaf' is likely to be the egg sack of the Stretch Spider/Long-jawed Orb Weaver, tetragnatha sp. (t. extensa). I found them on Sallow and Reed at 2 river/pond sites near Darlington and they took a long time to Id! 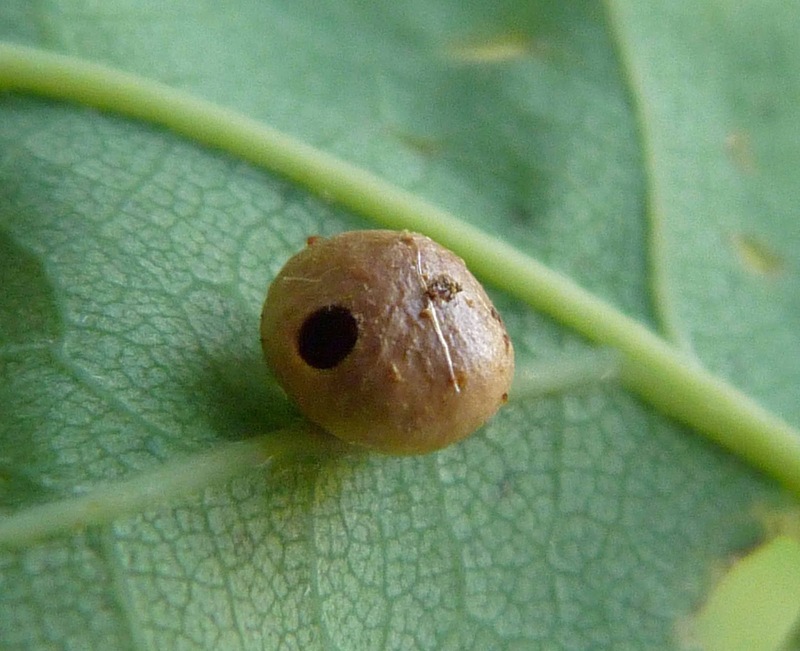 They camouflage their egg sack to look like mould or bird droppings. Many thanks for your comments Jill and sorry it took a while to respond. I like your ID - this makes sense given that insect galls are invariably found on the same species of tree and I kept finding these woolly balls on all the different types of tree. I assume spiders lay eggs on a variety of trees? It does mean that these should not really be included on this website, but I thought I should keep them in, in case someone else finds one and struggles to identify it. Thanks again - much appreciated.